It may be winter in the northern hemisphere (at least some days), but there is still plenty to see if you go for a walk in the woods. Some plants may be easier to spot in winter than they are during the growing season, because they have less competition for light, and for your attention. 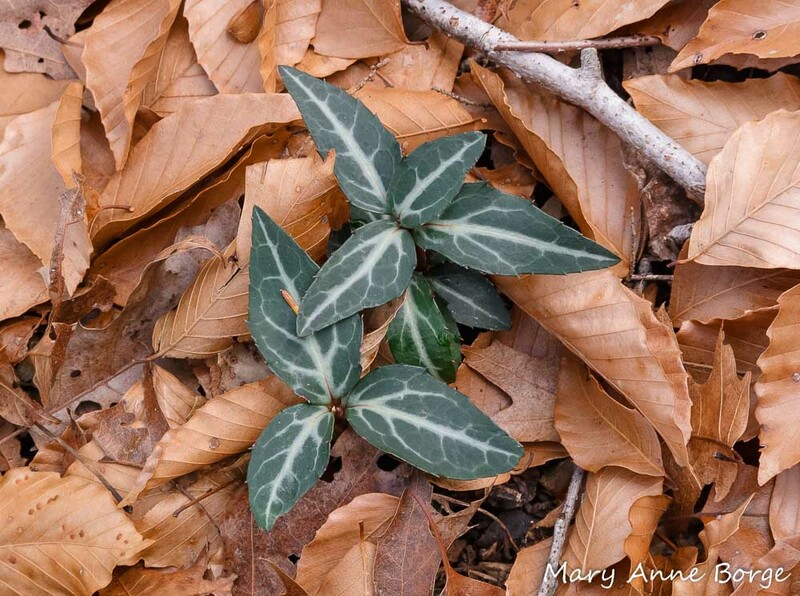 Striped Wintergreen (Chimaphila maculata) is one of those plants. 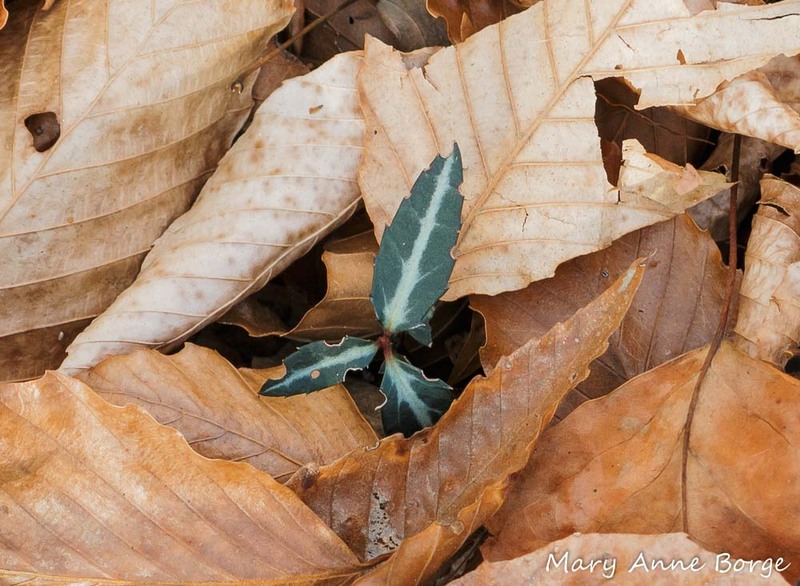 Striped Wintergreen can be seen in woodlands, skimming just above the fallen leaves. A clue that winter is the perfect time to look for this plant is found in the translation of its genus, ‘Chimaphila’, whose origins are the Greek words ‘cheima’, which means ‘winter’ and ‘phileo’, which translates as ‘to love’. 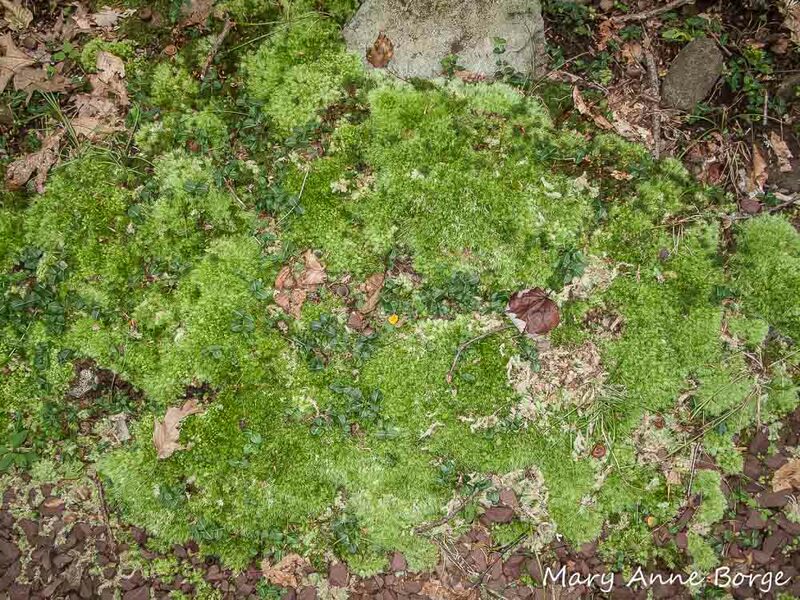 Plants of this genus are named for their love of winter. Why do they love winter? 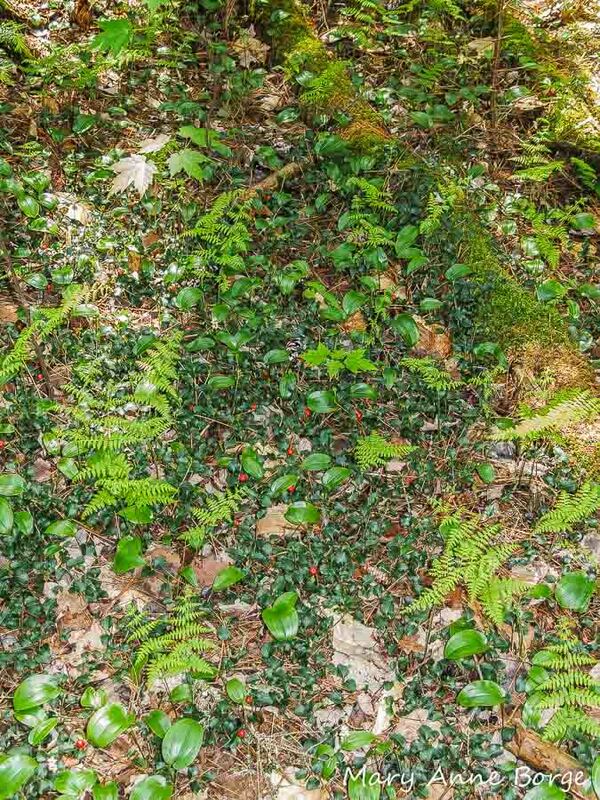 Striped Wintergreen is an evergreen perennial of the forest understory, growing to a height of about 4 – 12 inches (10 – 30 cm). Somewhat woody at the base of the stem, botanists classify this species as a shrub or subshrub. Its green and white striped leaves make it easy to spot in the winter months when leaves have fallen from the deciduous trees and shrubs that tower over this diminutive plant. 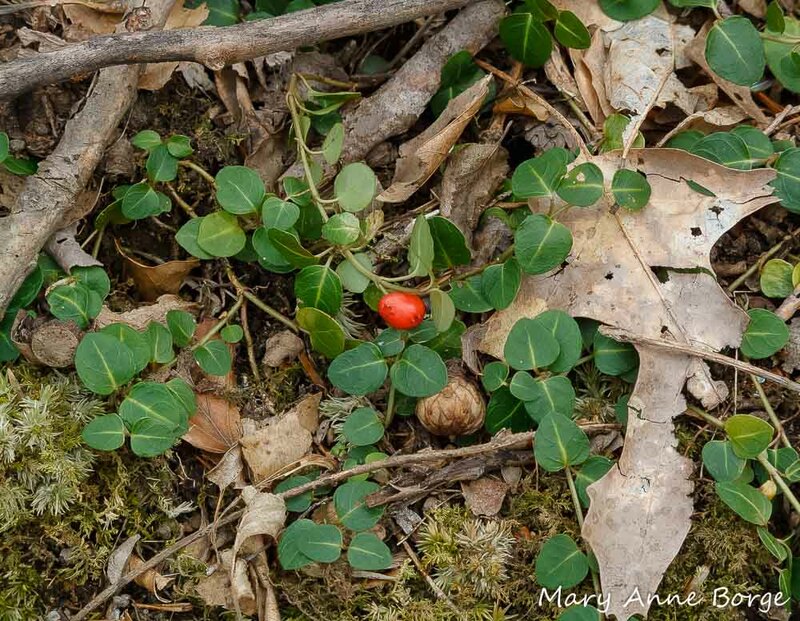 During the growing season, its taller neighbors often obscure Striped Wintergreen from view, as well as from the sun’s rays. 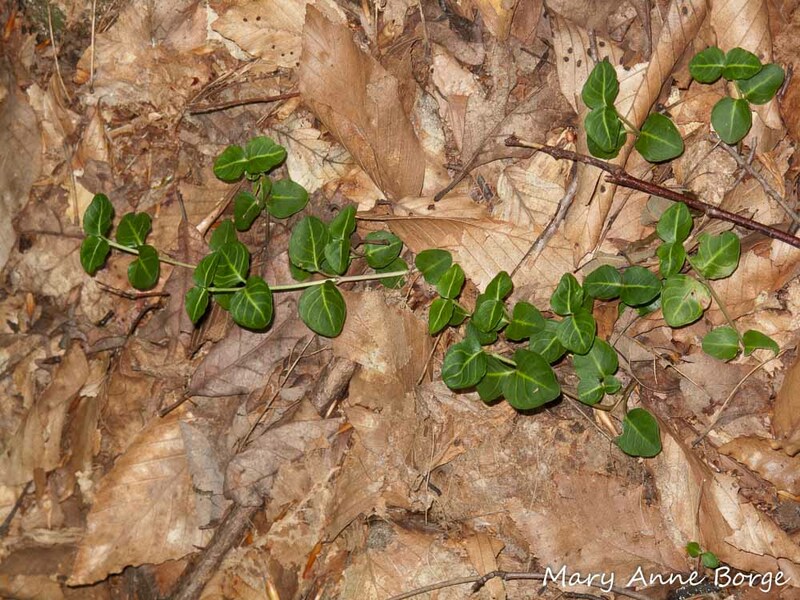 But throughout winter, Striped Wintergreen’s evergreen leaves have unfettered access to the sun’s energy. They can photosynthesize, store the energy, and make it available to support Striped Wintergreen’s summertime reproductive efforts. 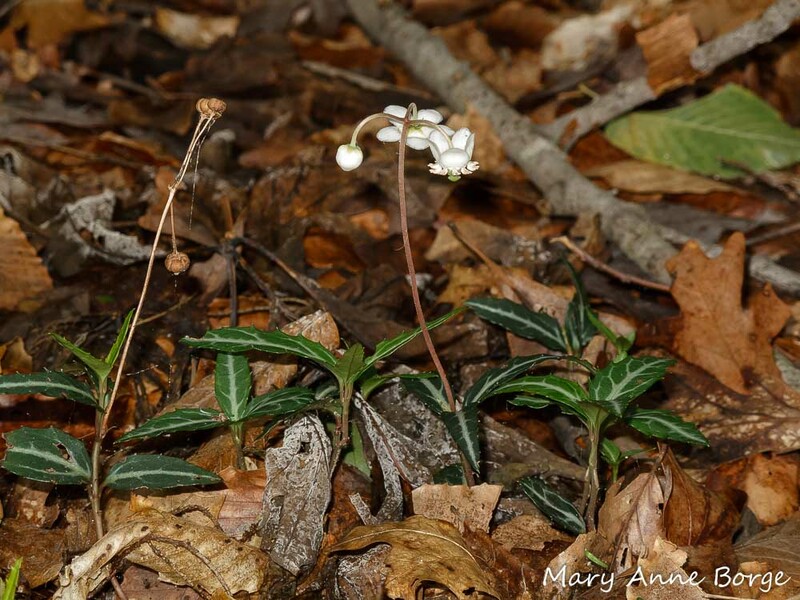 Striped Wintergreen is known by many other aliases (common names), including Spotted Wintergreen, Pipsissewa, and Rheumatism Root. Some of these names refer to the medicinal uses of this plant. Striped Wintergreen contains chemical compounds with antiseptic, antibacterial, and astringent properties, among others. One of the compounds, ursolic acid, is effective in treating arthritis and other causes of pain and inflammation. 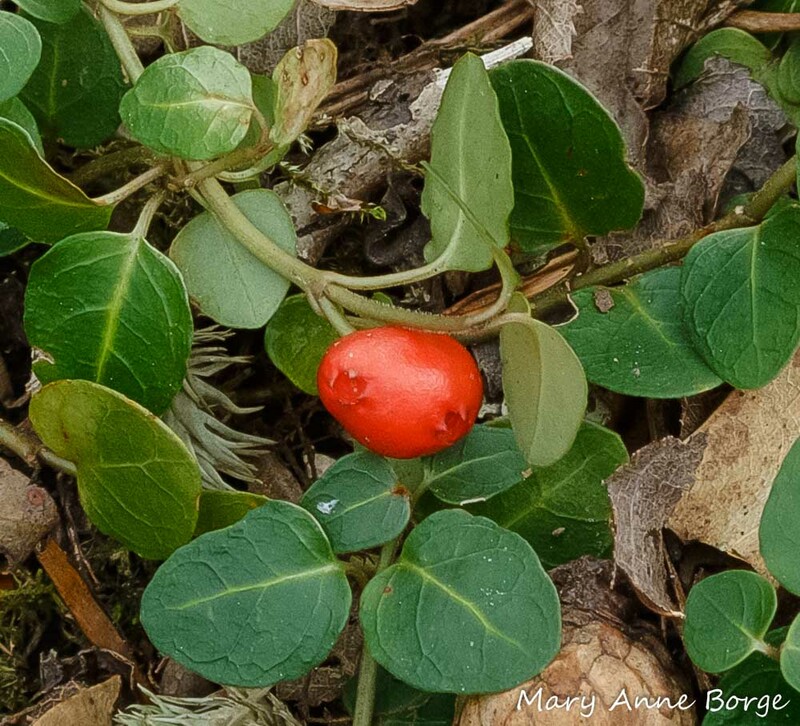 Striped Wintergreen and a close relative that is also called Pipsissewa (Chimaphila umbellata) have been used to treat urinary tract infections and kidney stones. The name Pipsissewa is derived from a Creek Native American word that means ‘to break into small pieces’, referring to stones in the urinary tract. 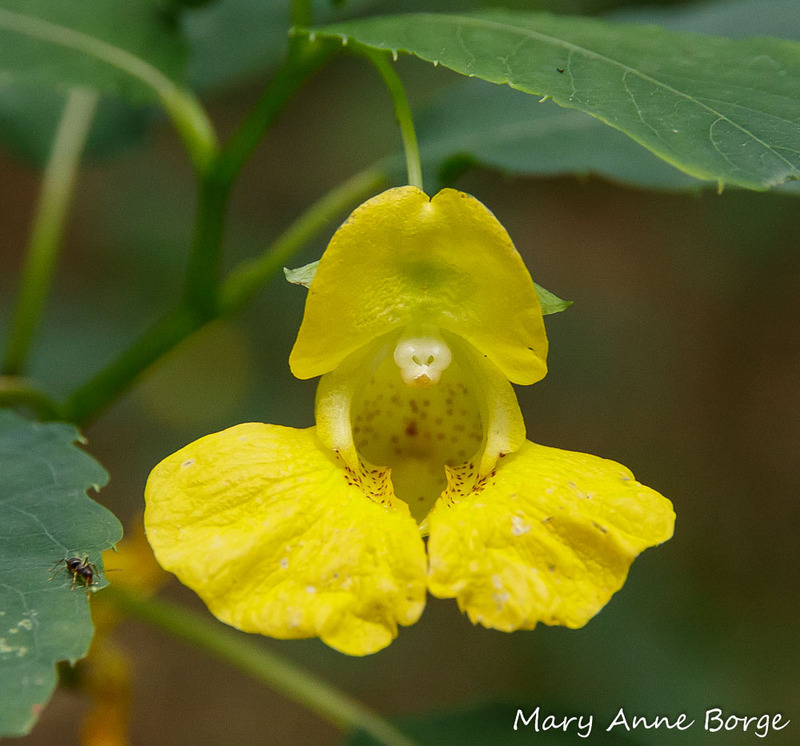 Is it just lucky happenstance that Striped Wintergreen contains compounds that have beneficial medicinal effects for humans? Not completely. Striped Wintergreen faces some of the same pressures that humans do from bacteria, fungi and microbes, all of which are present in the thousands in the fallen leaves with which Striped Wintergreen lives, and that are working to break down the leaves until they become the next layer of nutrient-filled soil. Striped Wintergreen has evolved to produce chemical compounds to protect itself from this efficient recycling team surrounding it. What is lucky for us is that these chemical constituents also have a positive effect in human bodies. 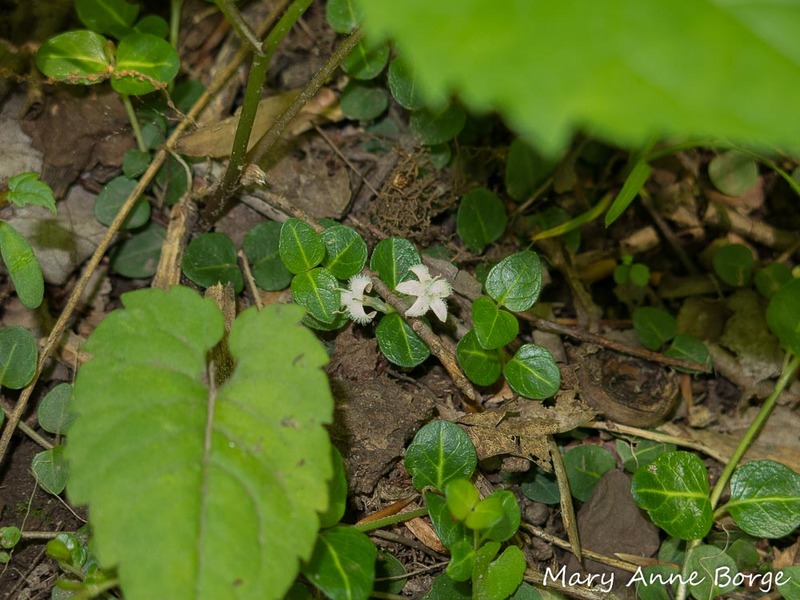 Striped Wintergreen blooms in summer, usually sometime from June through August. Striped Wintergreen (Chimaphila maculata) in bloom. Fruit capsule from previous season is visible on the left. When fully open, the flowers with their recurved petals resemble crowns, a possible explanation for another common name for this plant, Striped Prince’s Pine. 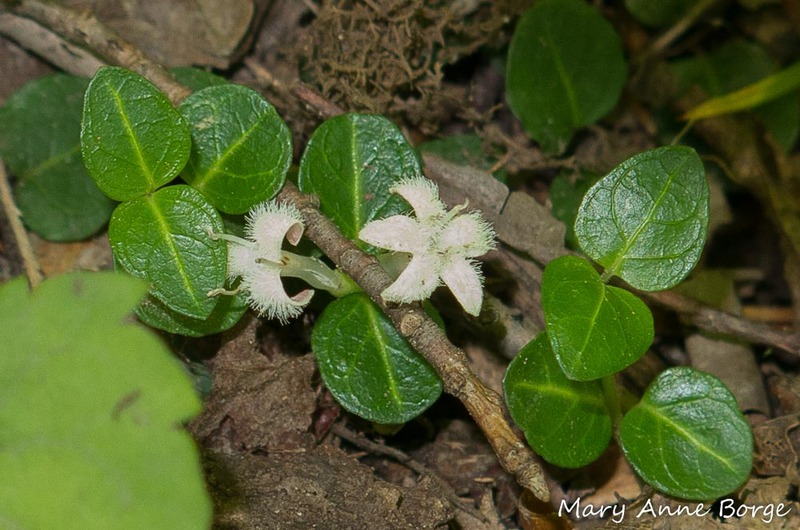 Striped Wintergreen (Chimaphila maculata) flower. Notice its resemblance to a tiny crown. 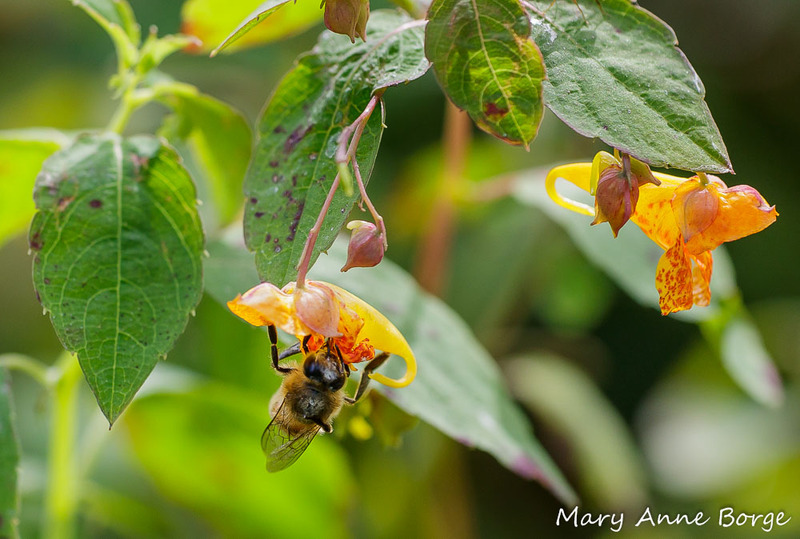 Striped Wintergreen’s primary pollinators are Bumble Bees (Bombus species), but Honey Bees (Apis mellifera) may also be enticed by nectar to visit the flowers. 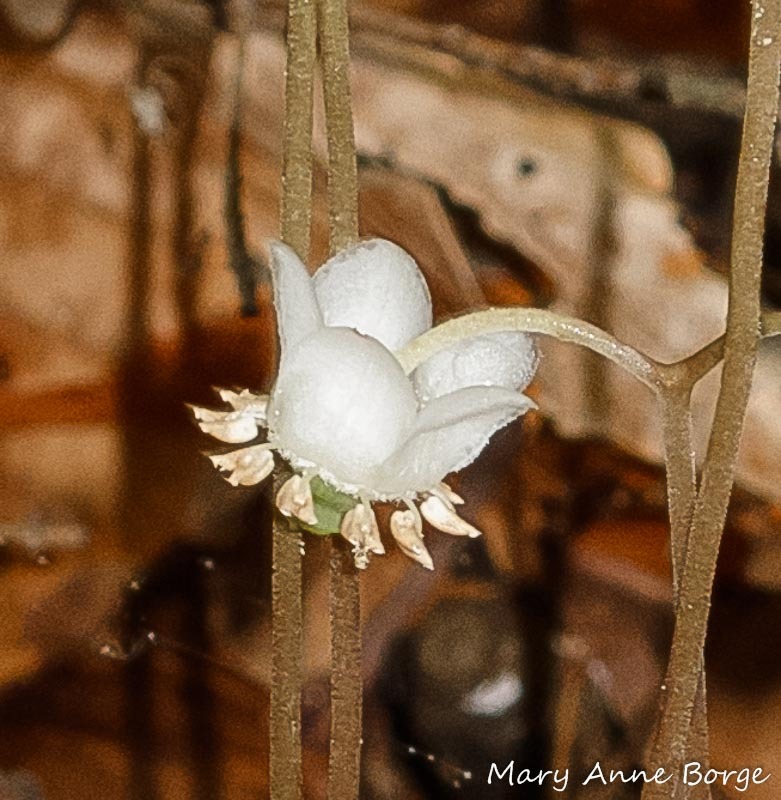 If the bees help Striped Wintergreen successfully achieve pollination, the resulting fruit is visible throughout the winter. These dry fruit capsules look like tiny turbans, or miniature winter squash split open at the seams to release the seeds inside. 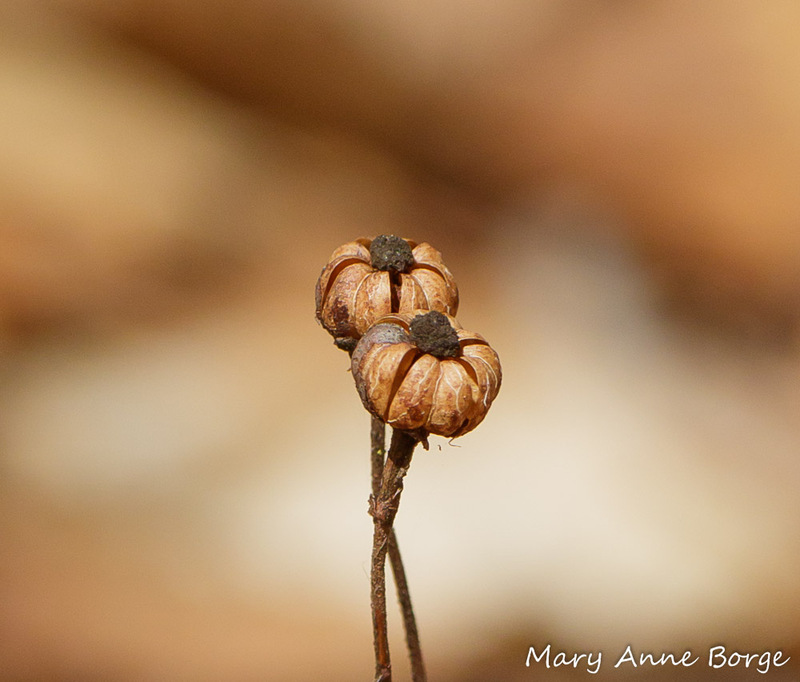 Striped Wintergreen (Chimaphila maculata) fruit capsules. 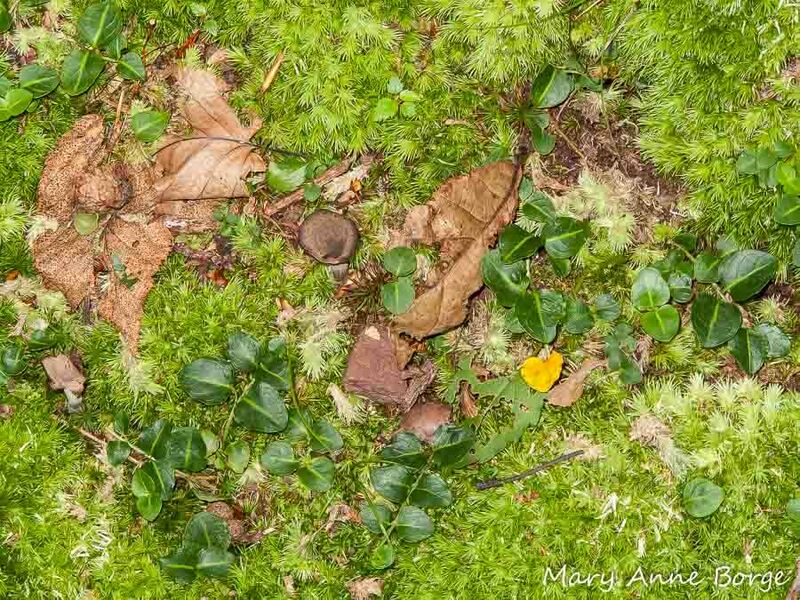 The chemical compounds present in Striped Wintergreen, along with leathery, waxy-coated leaves, are generally effective in deterring herbivores. Deer don’t typically browse this plant, even though it’s one of only a few that are green in the winter. But the photo below shows that someone, probably a Leaf-cutter Bee (Megachile species), has figured out a way to use parts of the leaves. Leaf-cutter bees harvest regularly-shaped oval, circular or semi-circular pieces of leaves to construct cells in their nests. Striped Wintergreen (Chimaphila maculata) with semi-circles removed from the leaf edges, probably by a Leaf-cutter Bee. Striped Wintergreen’s native range is the eastern third of the United States, north to a few locations in southern Ontario and Quebec provinces in Canada. 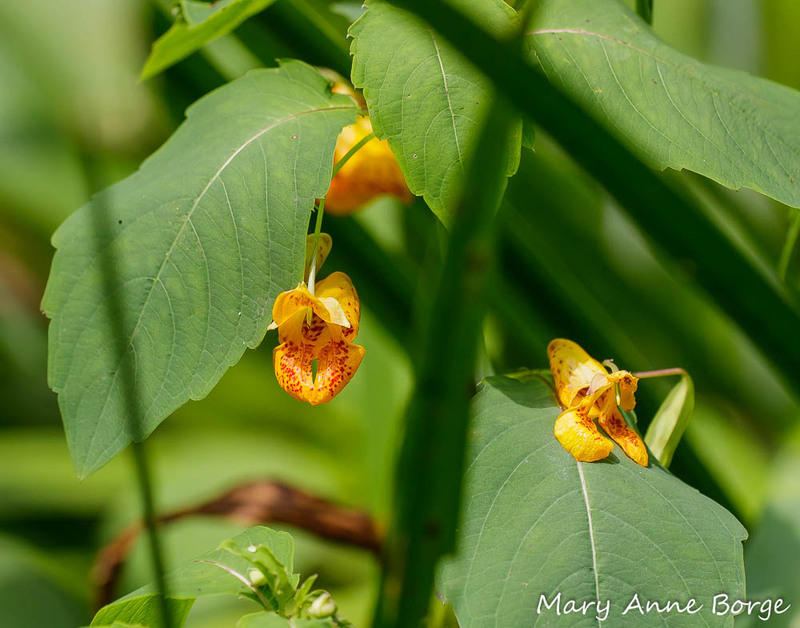 It’s rare at the edges of its range, and is listed as endangered in Illinois, Maine, Ontario and Quebec, and exploitably vulnerable in New York state. Experience some ‘Winter Love’ (another common name for Chimaphila maculata). 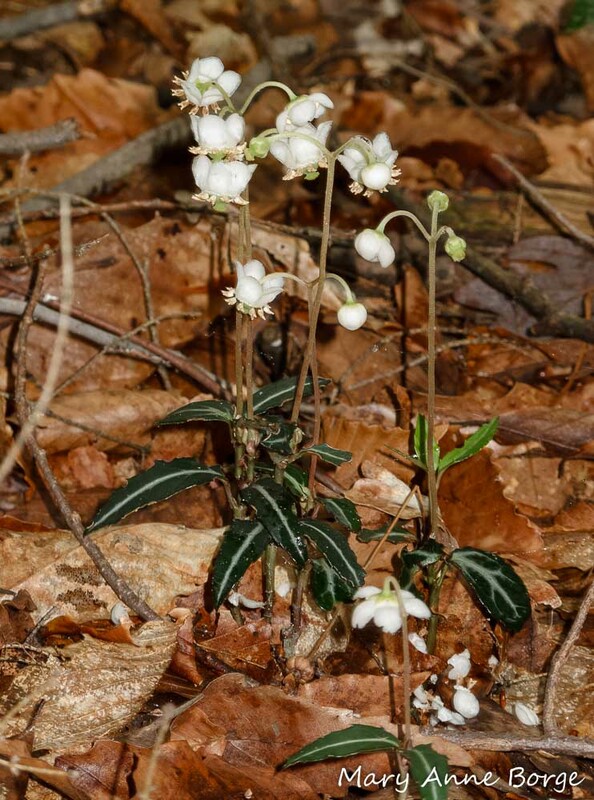 Look for Striped Wintergreen in winter, and you’ll know where to find it during the summer months when it’s in bloom. Striped Wintergreen (Chimaphila maculata) in bloom. Buhner, Stephen Harrod. Pipsissewa. From Planting the Future, Saving Our Medicinal Herbs, edited by Gladstar, Rosemary and Hirsch, Pamela. 2000. Martin, Laura C. Wildflower Folklore. 1984. 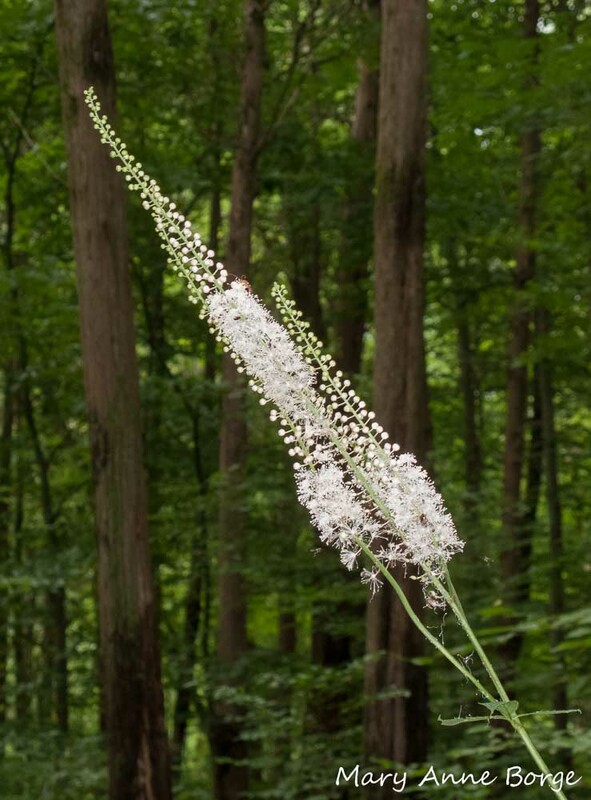 Black Cohosh (Actaea racemosa, synonym Cimicifuga racemosa) blooms in mid-summer, lighting up the forest understory. 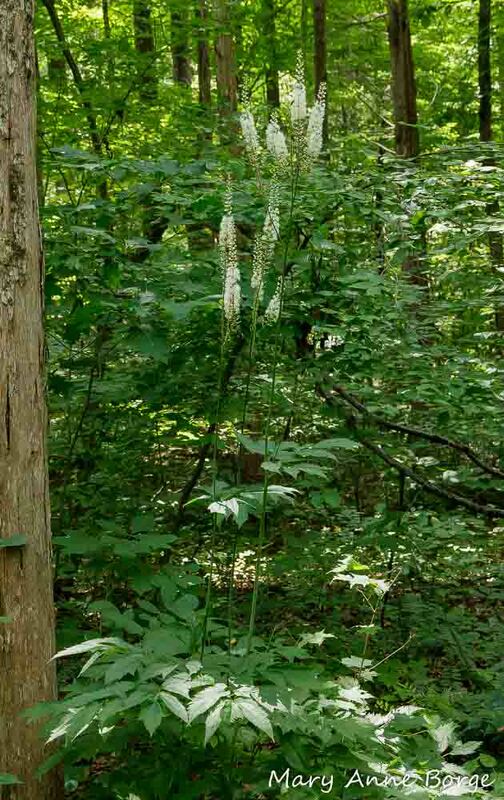 The spikes of white flowers seem to glow even in the dark, begging to be called Fairy Candles, one of the other common names by which Black Cohosh is known. Black Cohosh flowers are arranged in long narrow clusters called racemes, blooming from the bottom of the flower stalk to the top. Each individual flower looks like a pom-pom, formed by an aggregation of many stamens (the male reproductive parts) surrounding a single pistil (the female reproductive part). 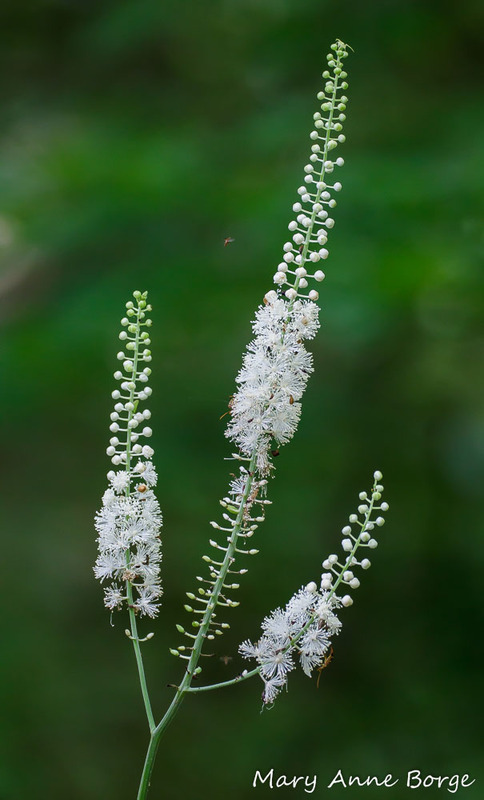 Black Cohosh depends on the assistance of animals to achieve pollination. 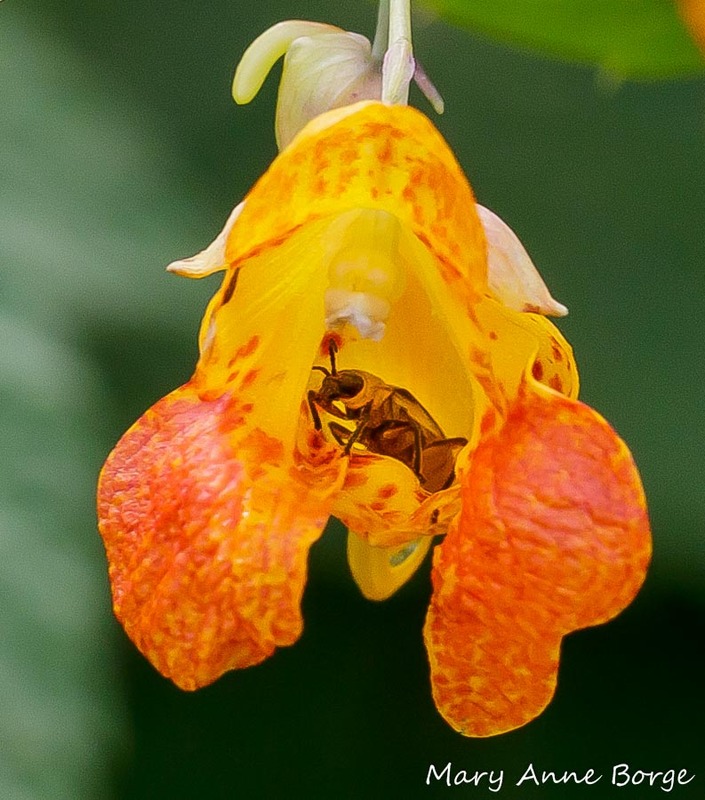 The flowers are visited by many species of insects whose bodies may come in contact with pollen dispensed from anthers at the tips of the stamens. Some of that pollen may adhere to the insect’s body. 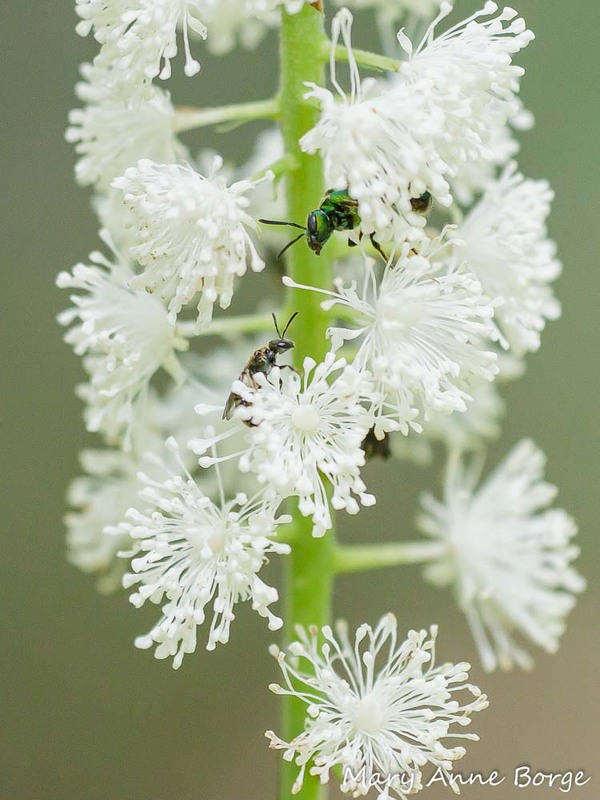 When the insect moves to a flower of another Black Cohosh plant and brushes against the flower’s stigma (the receptive part of the pistil), then Black Cohosh’s pollination goal is achieved. It’s not an accident that insects visit the flowers. Plants and animals have evolved together over centuries to depend on each other. 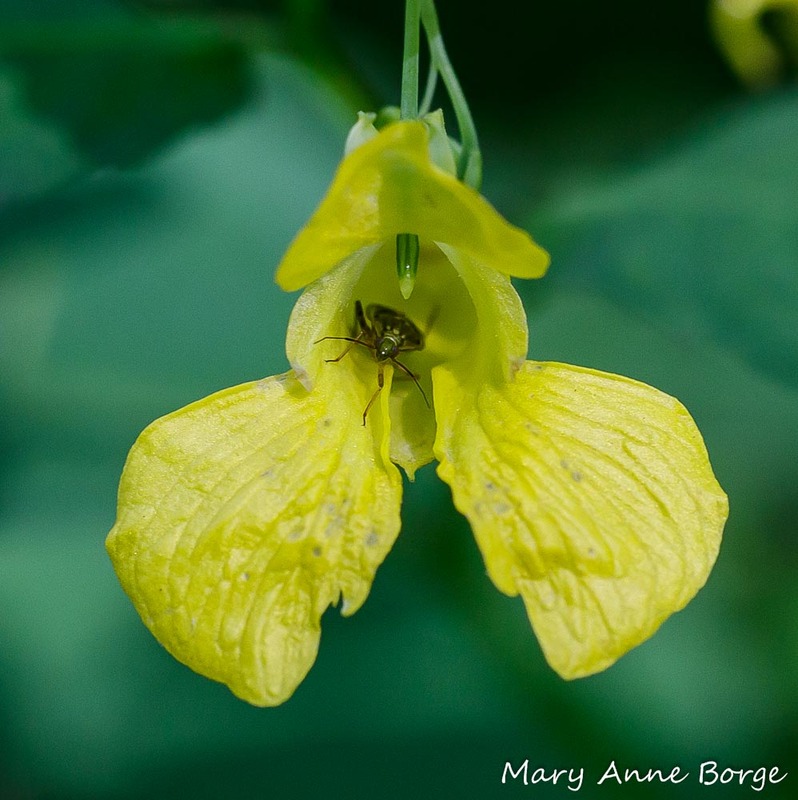 About 80% of flowering plants depend on animals to carry their pollen to other plants of the same species, helping them achieve successful cross-pollination. In exchange, many animals depend exclusively, or for at least part of their diet, on plants. 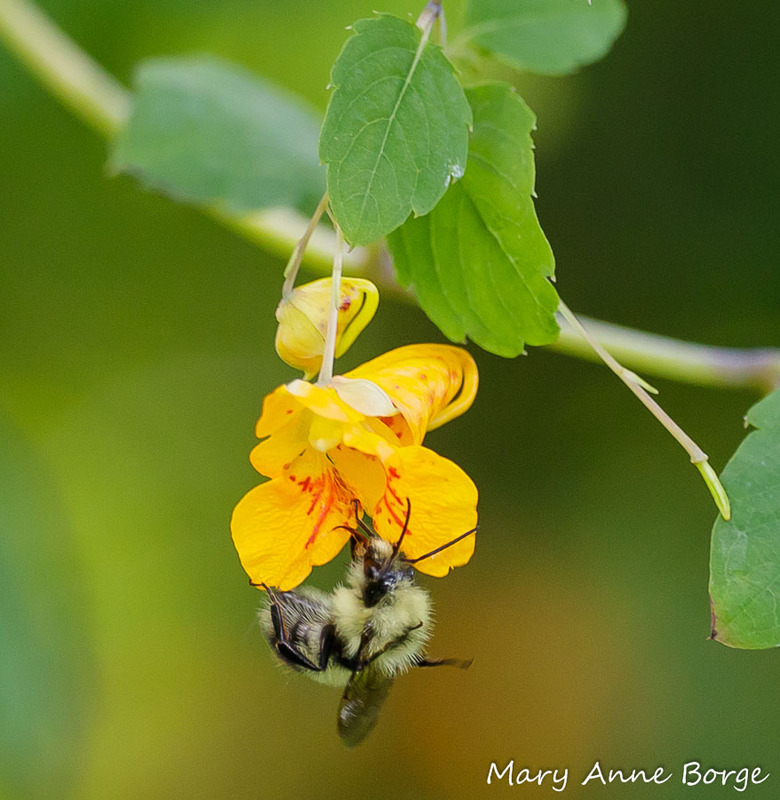 The most common food enticements that plants offer to flower visitors are nectar and pollen. 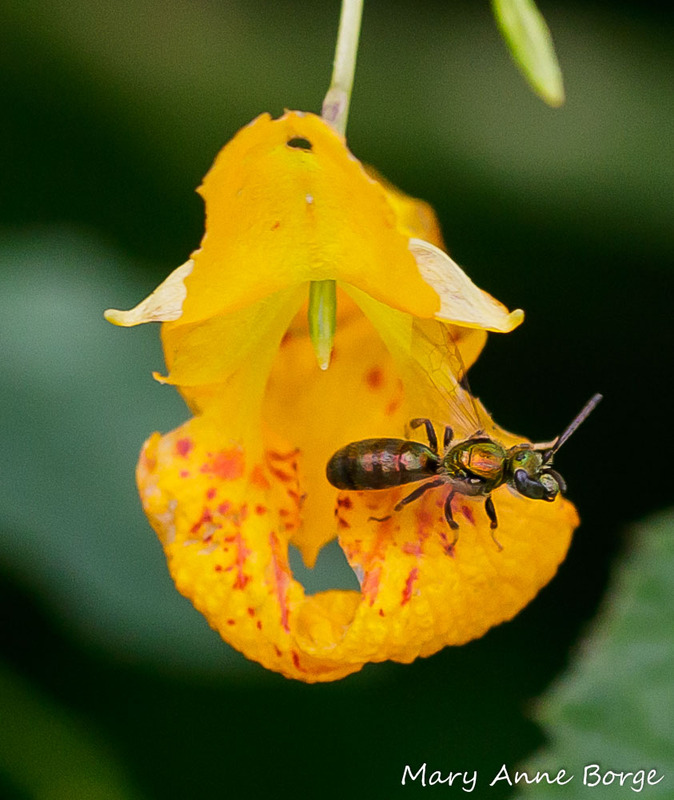 Many insects visit flowers for nectar, but some are also interested in eating pollen, and in the case of bees, harvesting it to bring back to their nests to feed their larvae. 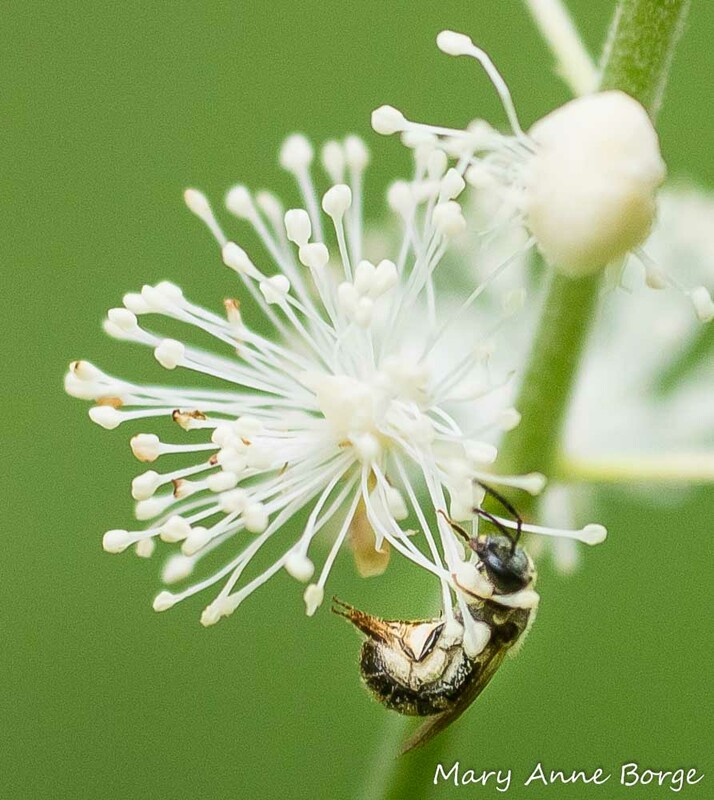 Black Cohosh has evolved a strategy of offering pollen, but not nectar, to entice potential pollinators. 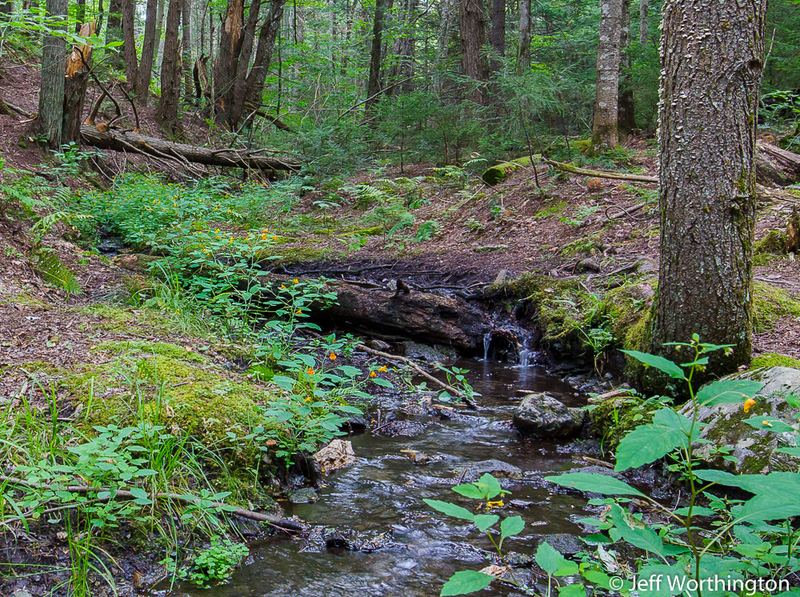 Plants evolve to be as efficient as possible, trying not to expend unnecessary resources. 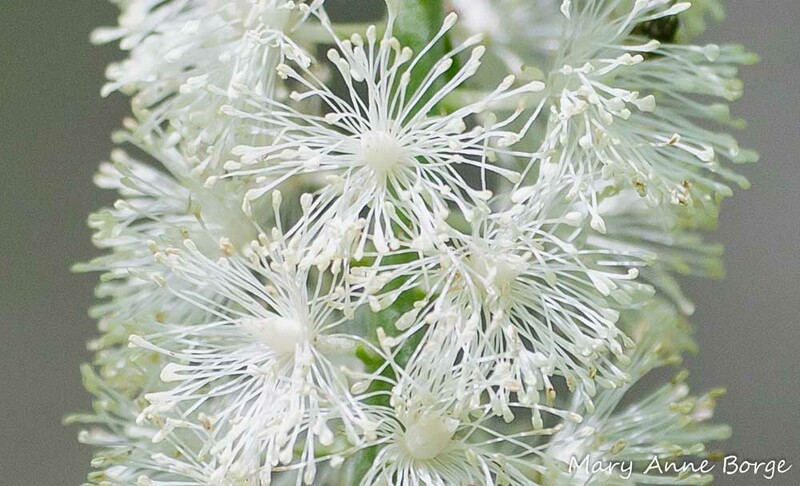 Black Cohosh is able to attract enough visitors to its flowers by offering them pollen only. 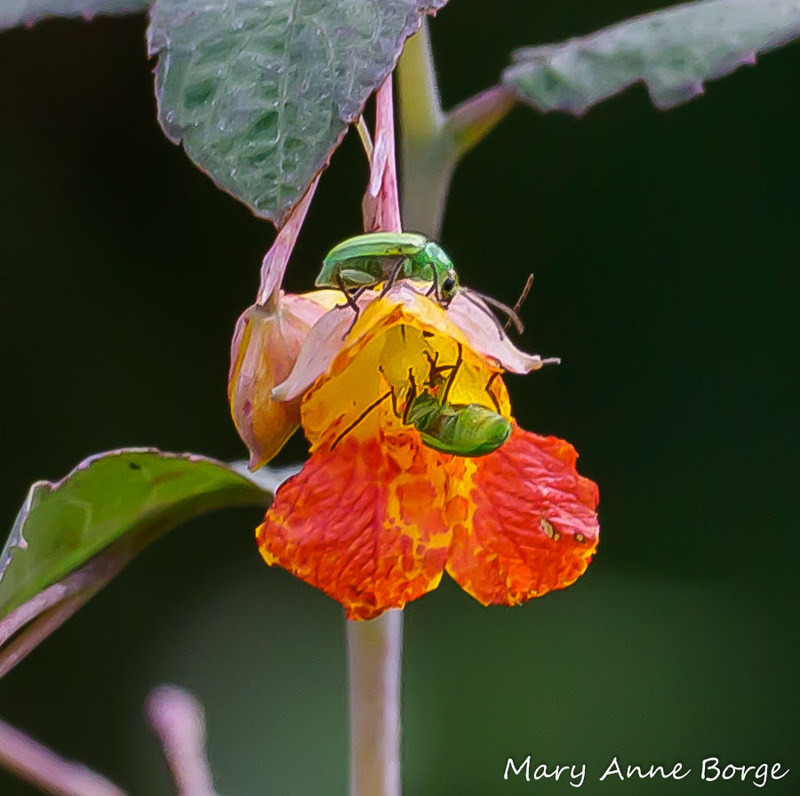 Insects want to eat pollen and plants want insects to transport their pollen to another plant of the same species. If this sounds like a potential conflict of interest, it is. 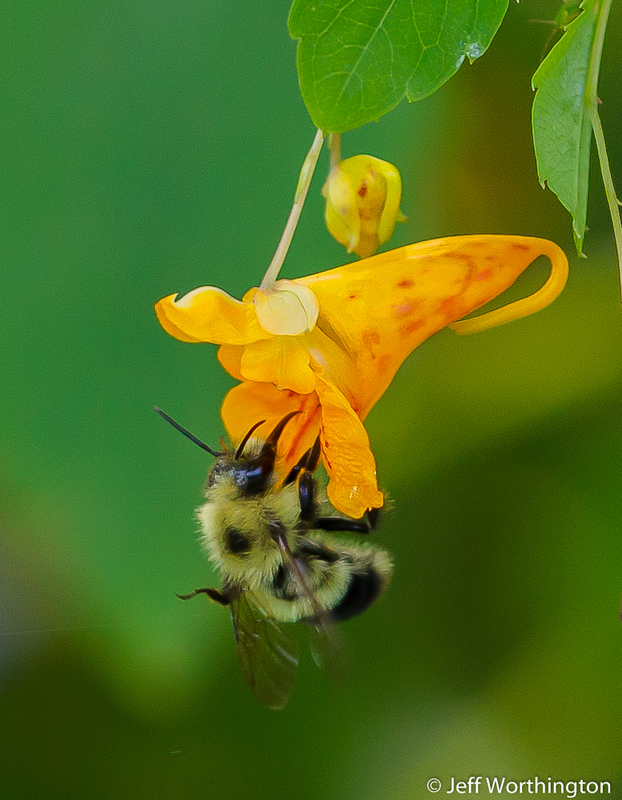 Only about 2% of pollen is actually used for pollination. 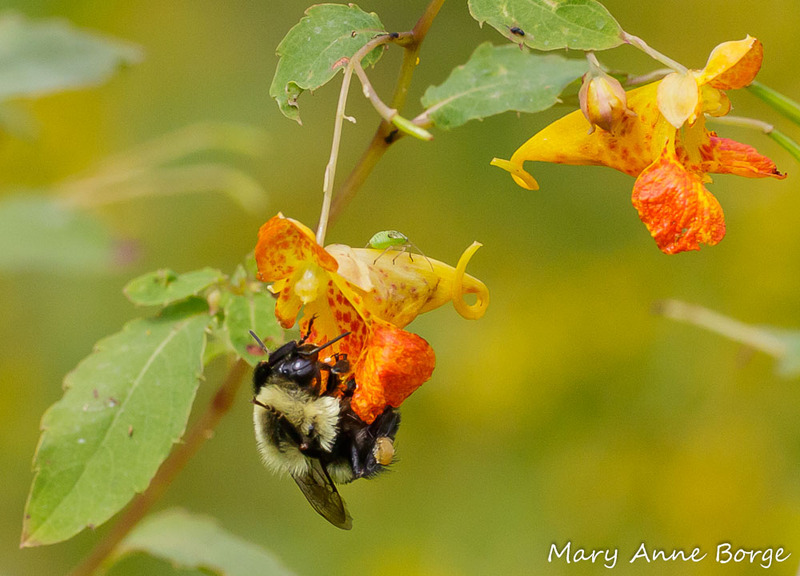 Potential pollinators or their offspring eat much of the remaining 98%. 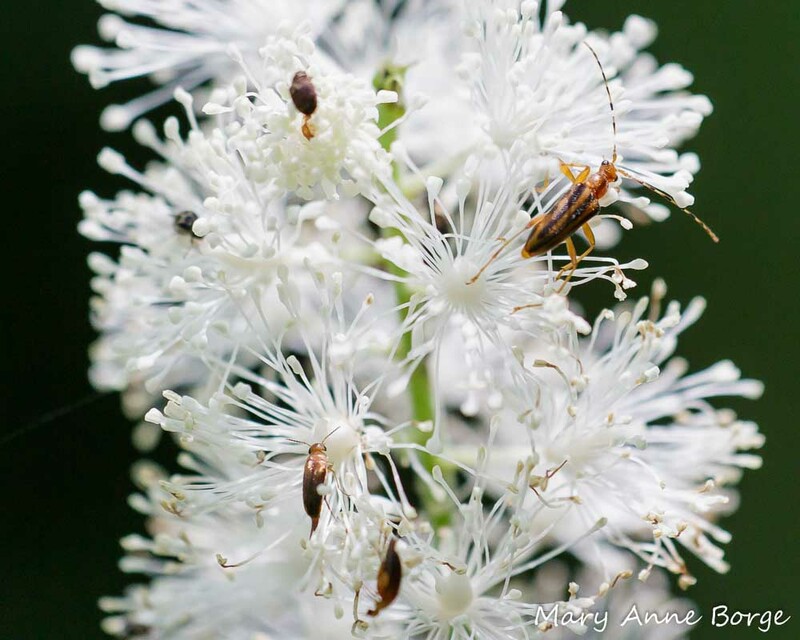 In spite of the fact that another common name for Black Cohosh is Bugbane, many insects are more attracted than deterred by its fragrance. 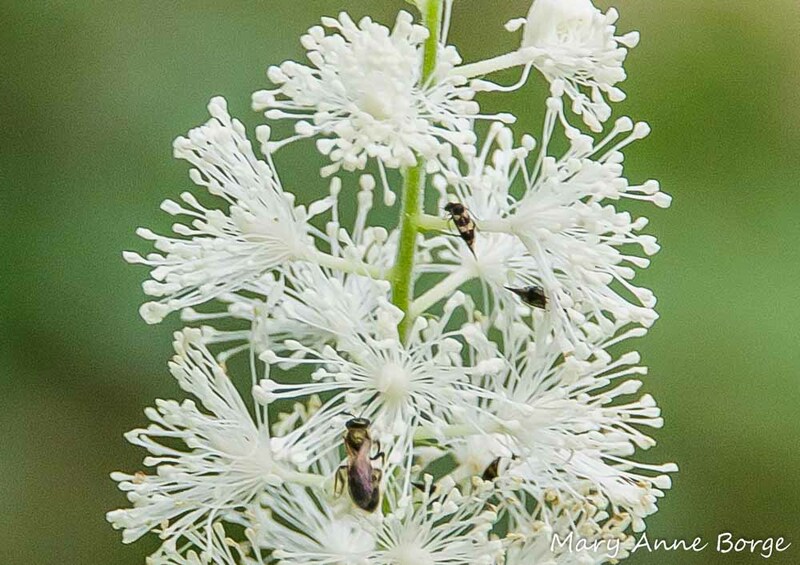 Bees, flies and beetles visit Black Cohosh flowers to eat or harvest pollen. 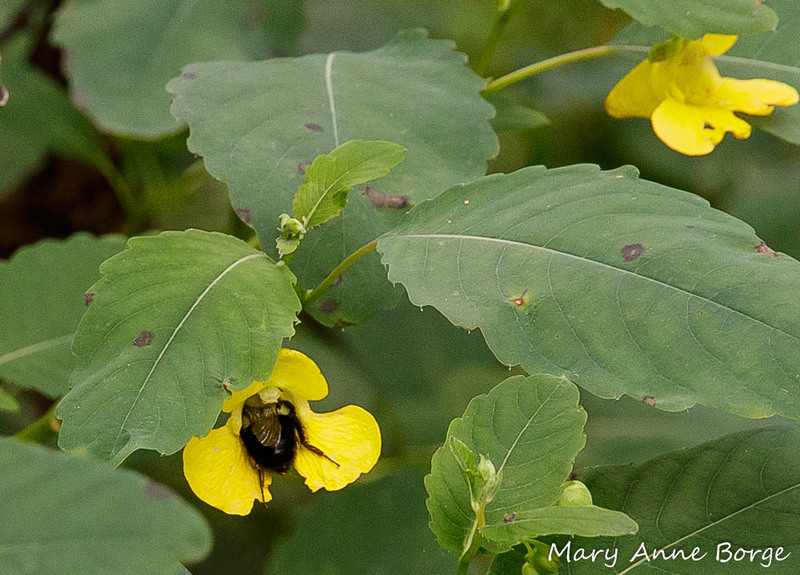 While I watched for just a few minutes, the activity at a small group of Black Cohosh plants included bees, flies and beetles. 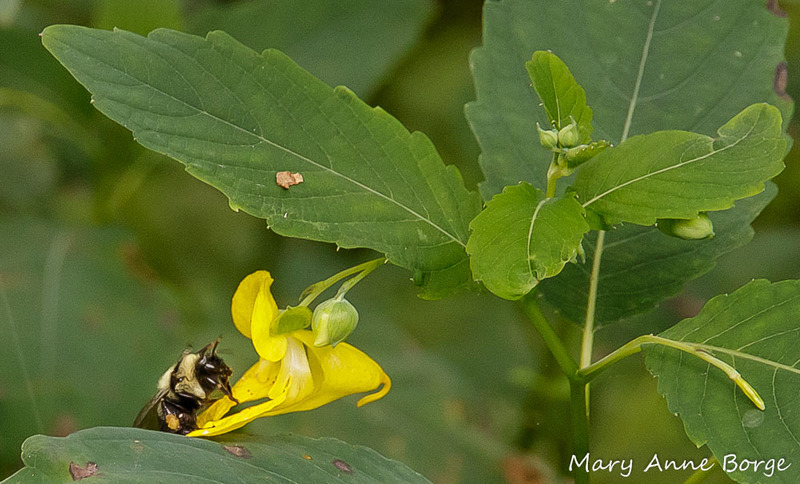 Bumble Bees, Sweat Bees, and Leaf-cutter Bees, all worked the flowers. Bumble Bee visits were the most brief. They stopped for just a few seconds per plant before moving on to another. 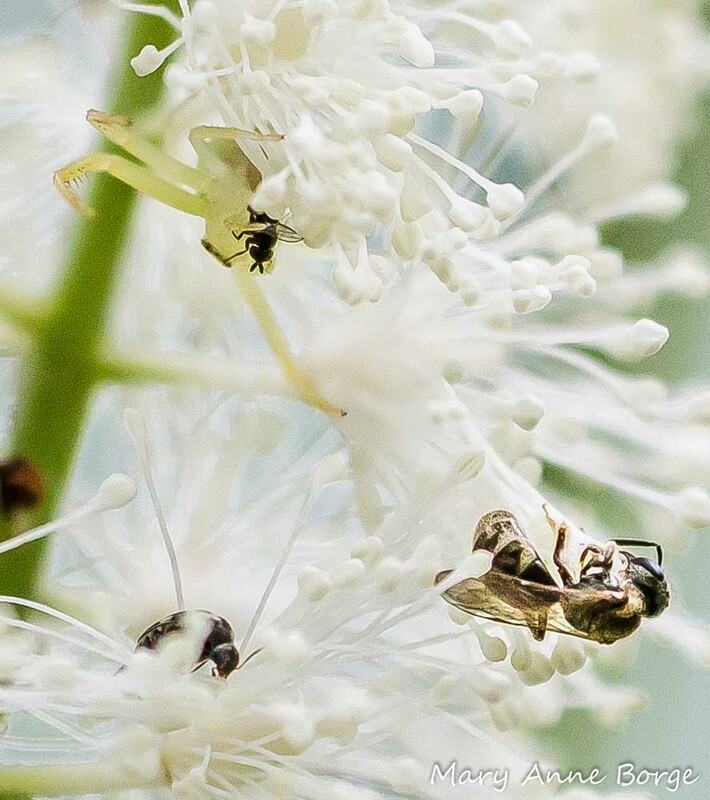 It may seem counterintuitive, but this may make Bumble Bees the most successful of Black Cohosh’s cross-pollinators, since they are the most likely to move the pollen to a different plant. 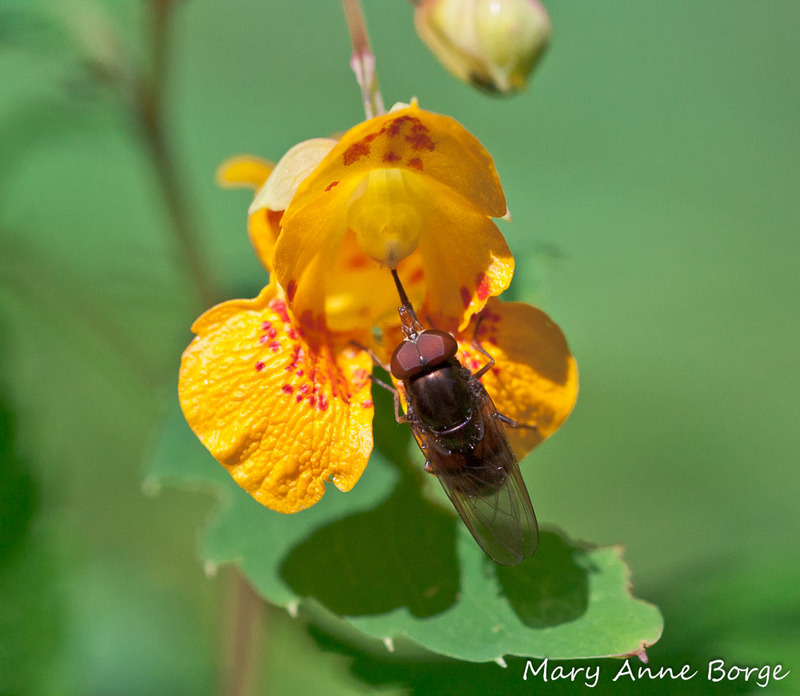 A Flower or Syrphid Fly (Toxomerus geminatus) dined on the flowers’ pollen. At least two species of tiny Tumbling Flower Beetles (Falsomordellistena pubescens and Mordellistena fuscipennis) munched on the flowers’ tissues. 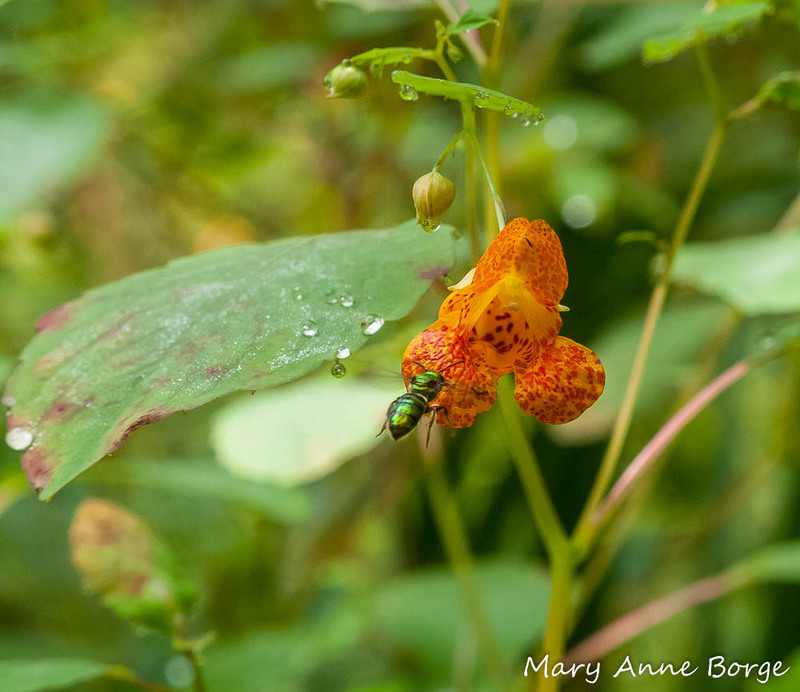 Tumbling Flower Beetles are named for their behavior when threatened; they bounce and tumble unpredictably and may fly away, carrying pollen to another plant, possibly helping to meet Black Cohosh’s pollination needs. 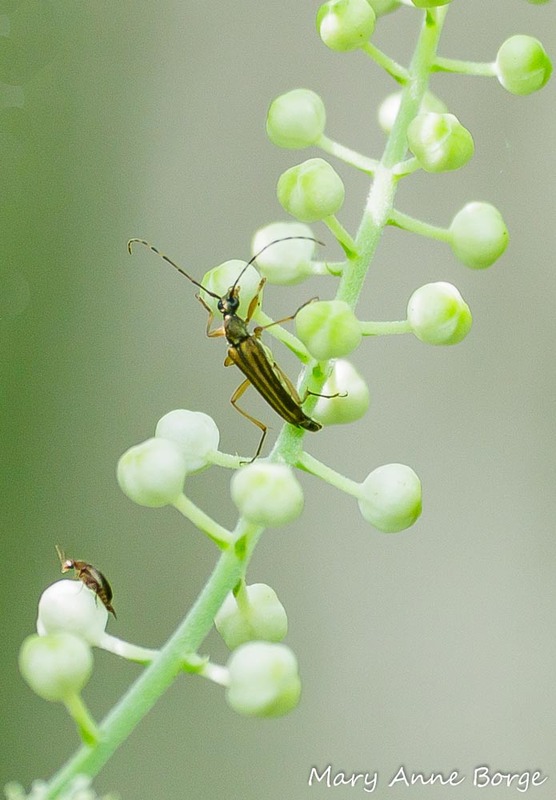 The Tumbling Flower Beetles were joined by at least three species of Longhorn Beetles, the Banded Longhorn Beetle (Typocerus velutinus), and two others, Metacmaeops vittata, and Analeptura lineola. 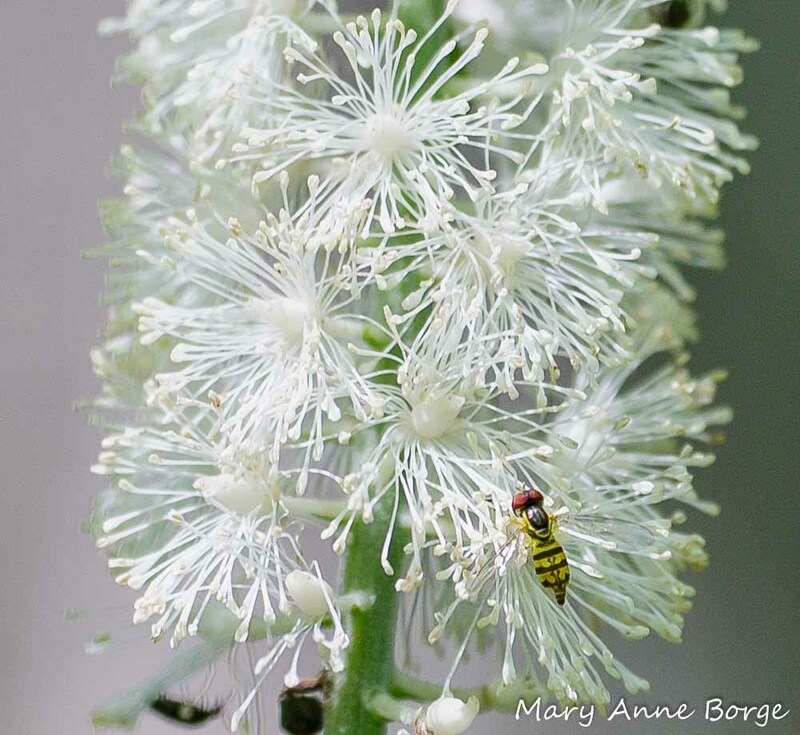 For an insect, visiting Black Cohosh flowers is not without its risks. Predators like the perfectly camouflaged Crab Spider in the photo below may be lurking in the shadows, waiting for an unwary victim. Black Cohosh is the only food Appalachian Azure butterfly caterpillars can eat. Female butterflies lay their eggs on flower buds. When the caterpillars hatch, they begin eating the buds and flowers, moving on to leaves if no flowers remain. 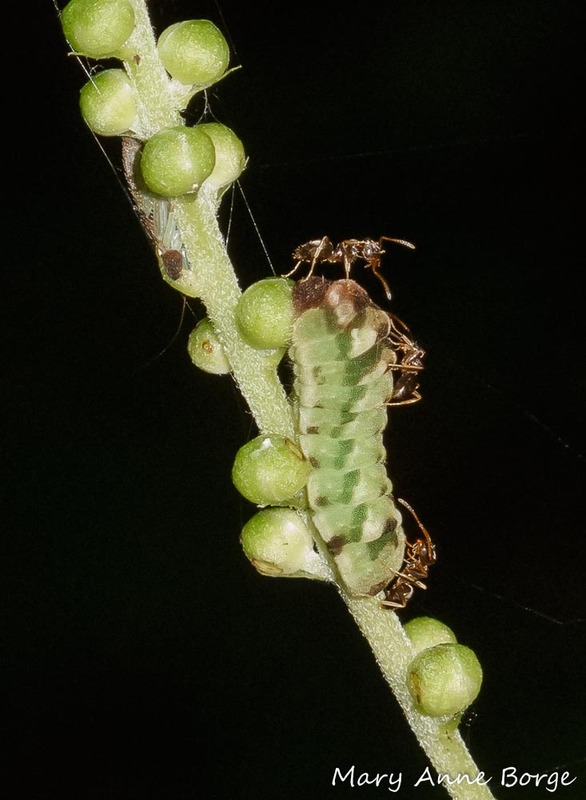 Like the other Azure butterfly caterpillars, the Appalachian Azure caterpillars are protected by ants in exchange for the delicious honeydew the caterpillars excrete. Depending on the species, ants have different forms of defensive weapons; they may bite, sting, or spray an acid at their enemy targets, deterring even birds from their prey. 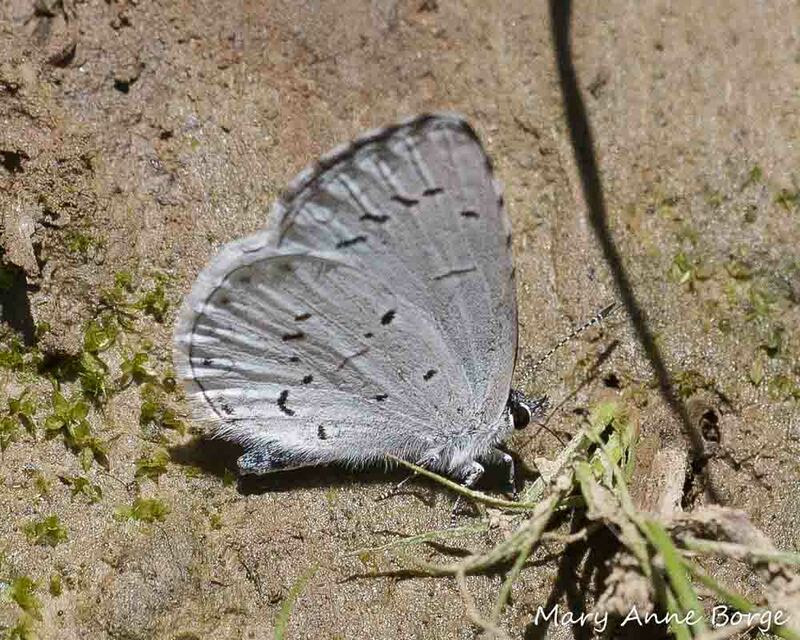 Although I have seen Appalachian Azure caterpillars, I’ve never seen the butterfly. The Appalachian Azure closely resembles the Summer Azure, pictured below. People use Black Cohosh, primarily the root, for medicinal purposes. Black Cohosh contains chemical compounds that are anti-inflammatory, antirheumatic, and that have efficacy in managing female reproductive system problems. Black Cohosh is approved in Germany for treating menopausal symptoms. Several indigenous Native American tribes also used Black Cohosh to treat rheumatism and other ailments. Black Cohosh is native primarily in the eastern United States and the Canadian provinces of Quebec and Ontario. 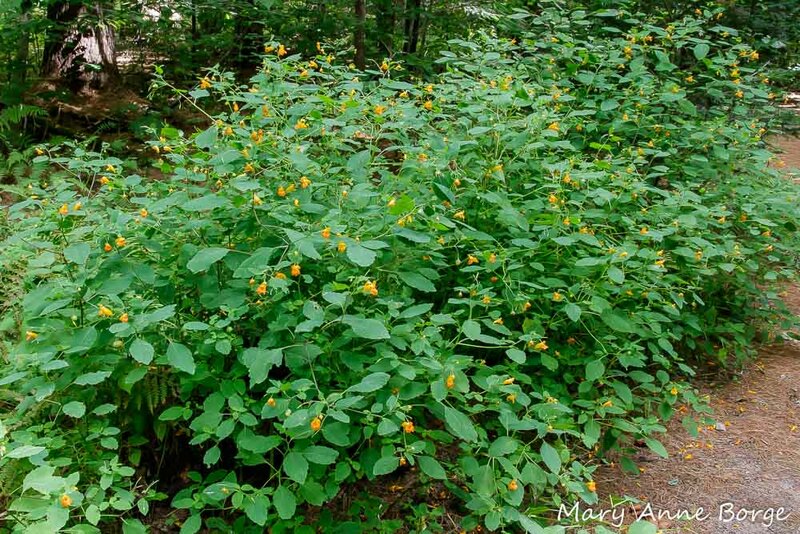 It grows in rich, moist woods, in ravines and on slopes. Its height can range from just over two feet (.7 meters) to as much as eight feet (2.5 meters). Black Cohosh will light up a shade garden, blooming from late June through early August. Who uses Black Cohosh? 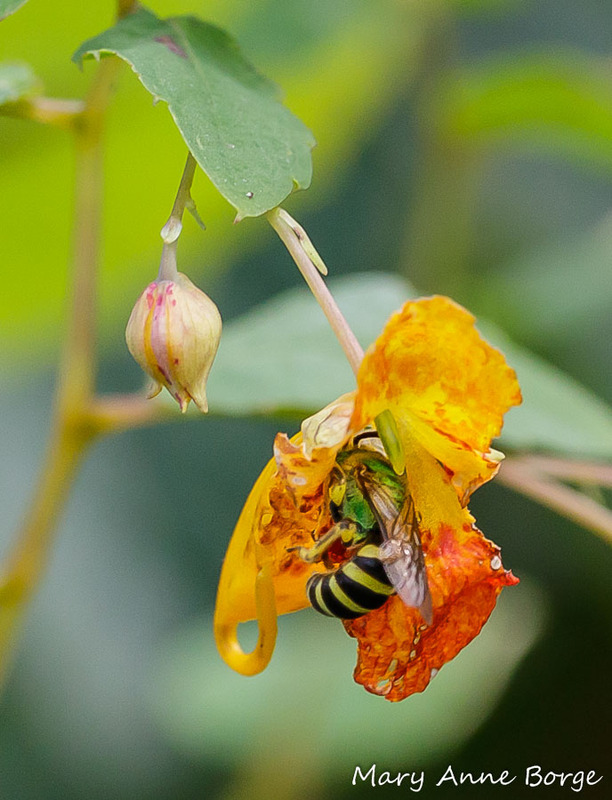 Insects do, including bees, flies, beetles, ants, and butterflies; spiders and other predators of the insects feeding there do, and even people use it, for medicinal purposes and for the beauty it brings to a garden. Eisner, Thomas. For Love of Insects. 2003. 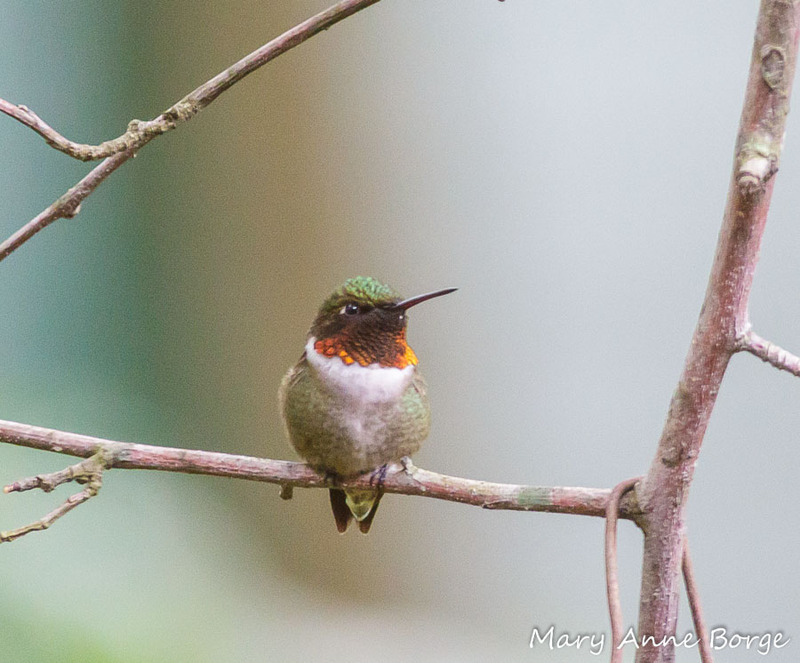 Black Cherry – for Wildlife, and People, too! Black Cherry or Wild Black Cherry (Prunus serotina) is a bountiful tree for wildlife, and an important species for humans, too. It blooms in spring, with a profusion of long, slender, densely packed flower clusters. 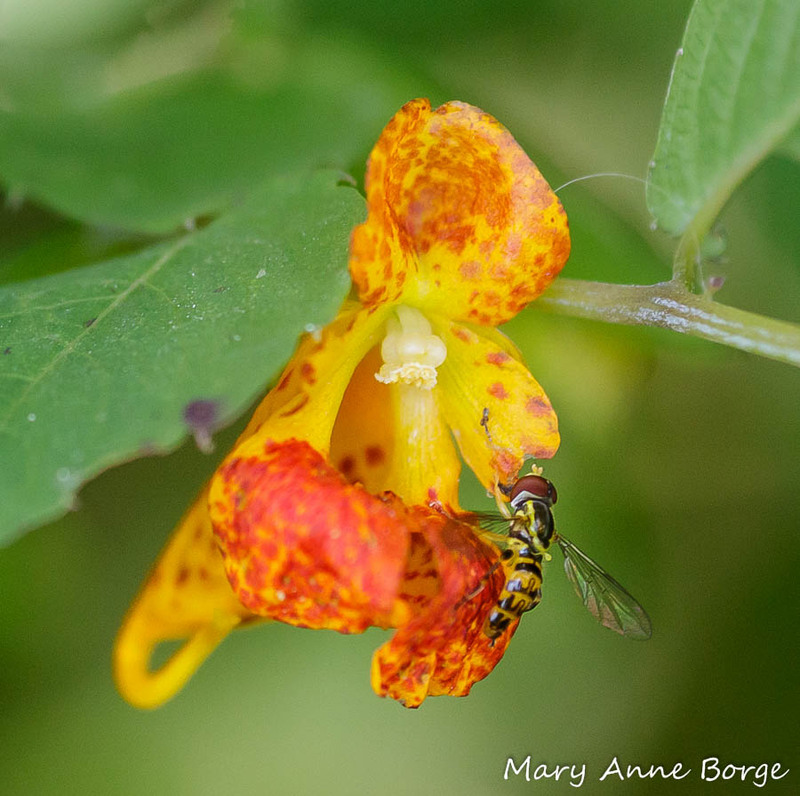 The flowers offer nectar and pollen as enticements to a variety of bee and fly species who need this food to survive. 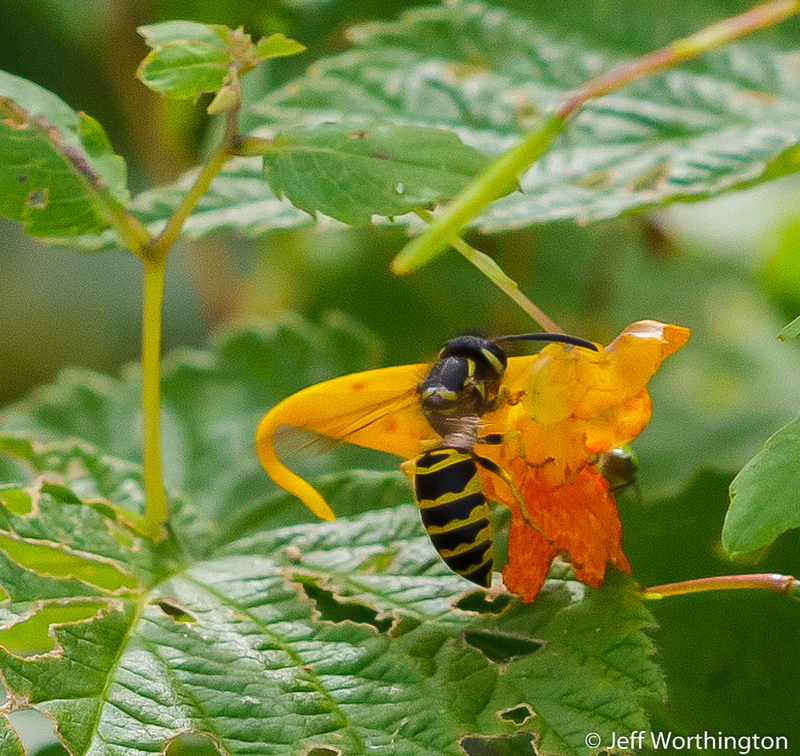 The insects become Black Cherry’s unsuspecting pollination partners. In return for the food provided to these insect floral visitors, the flowers benefit by having some of their pollen transported on the insects’ bodies and deposited advantageously for pollination on other Black Cherry flowers. 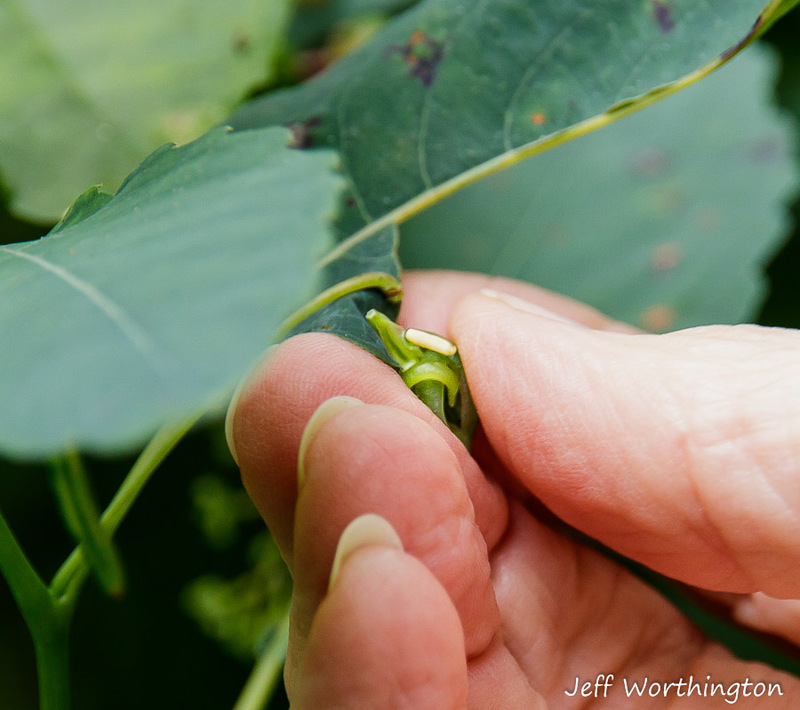 Successful pollination will result in fruit that ripens in late summer and fall. A broad spectrum of animals eat Black Cherry’s fleshy fruit. 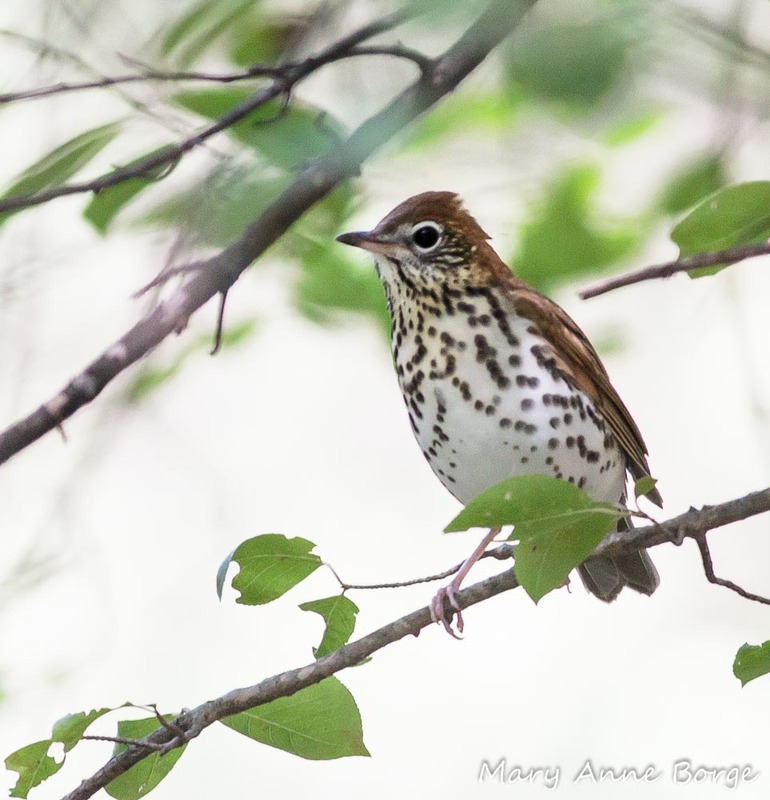 Many thrushes, woodpeckers, sparrows, bluebirds, tanagers, orioles, and Cedar Waxings are among the dozens of bird species that eat the fruit. 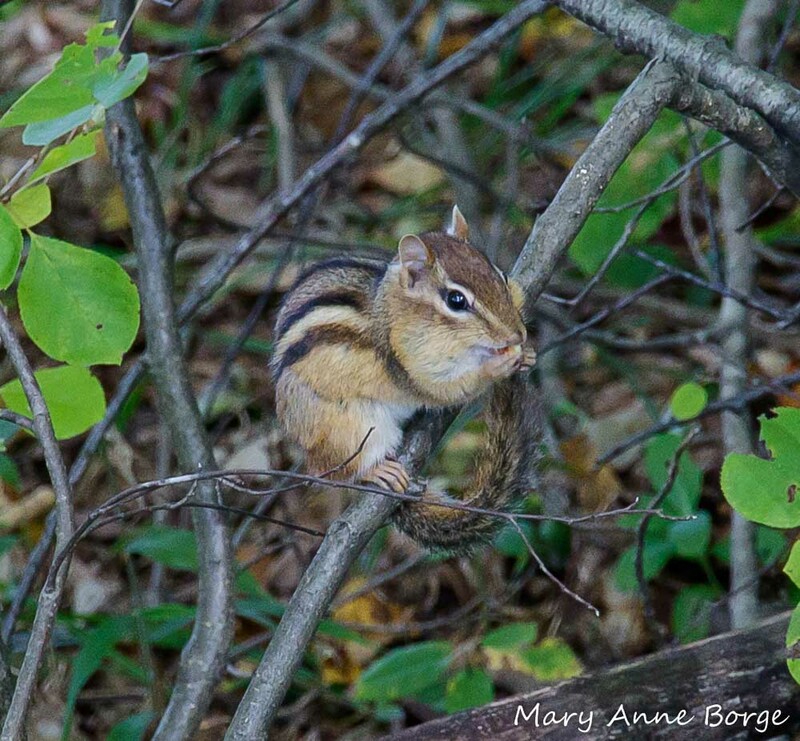 Mammals as diverse as fox, squirrels, chipmunks, mice and even Black Bears eat Black Cherry’s fruit. The fruit has evolved to lure animals to help Black Cherry spread its seeds. In exchange for the meal, the seeds are ‘dispersed’ after traveling through the animals’ digestive tracts. Hundreds of insect species depend on Black Cherry for food, and in some cases, shelter. 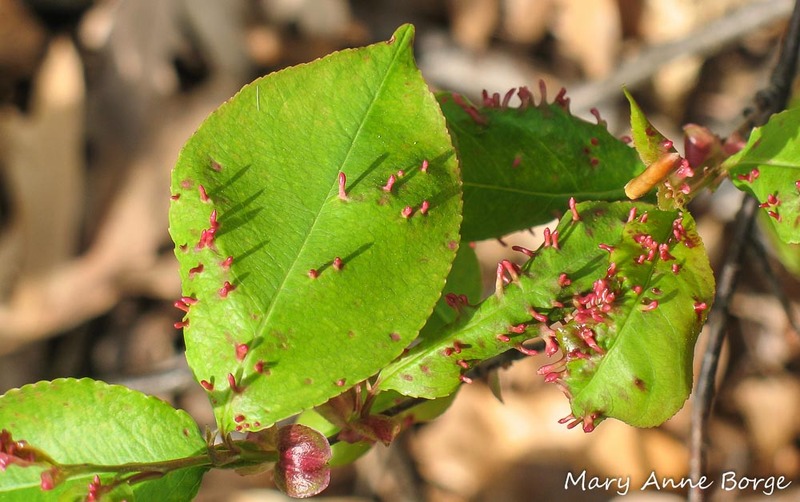 In spring, finger galls caused by a mite (Eriophyes cerasicrumena) are conspicuous on Black Cherry leaves. 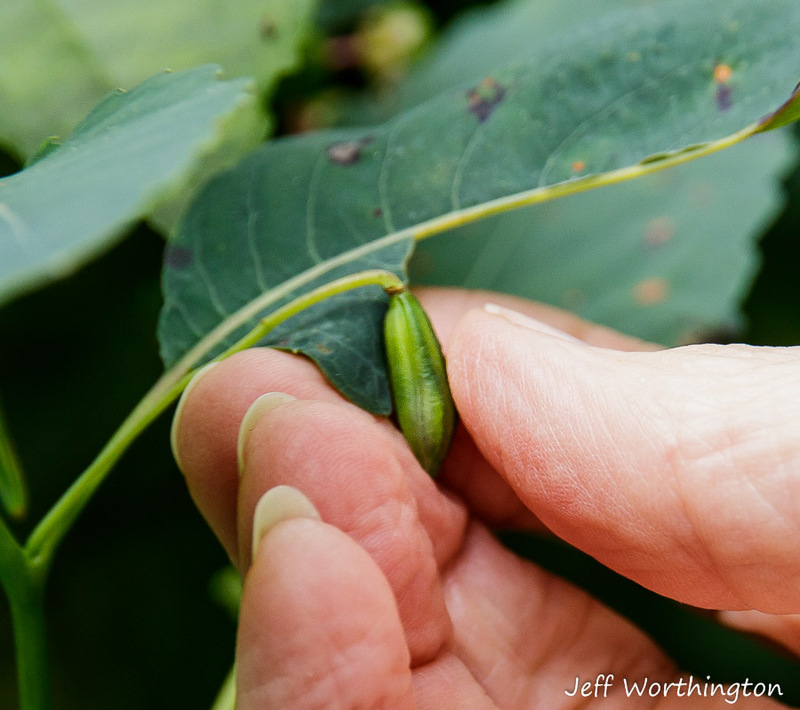 A gall is a plant’s reaction to being used as food and shelter by an insect. The mite will feed on the tissue inside the gall until the mite matures and emerges from the gall. You may be used to seeing Eastern Tiger Swallowtail butterflies feeding on nectar from a variety of plants. But Eastern Tiger Swallowtail caterpillars have a completely different diet. 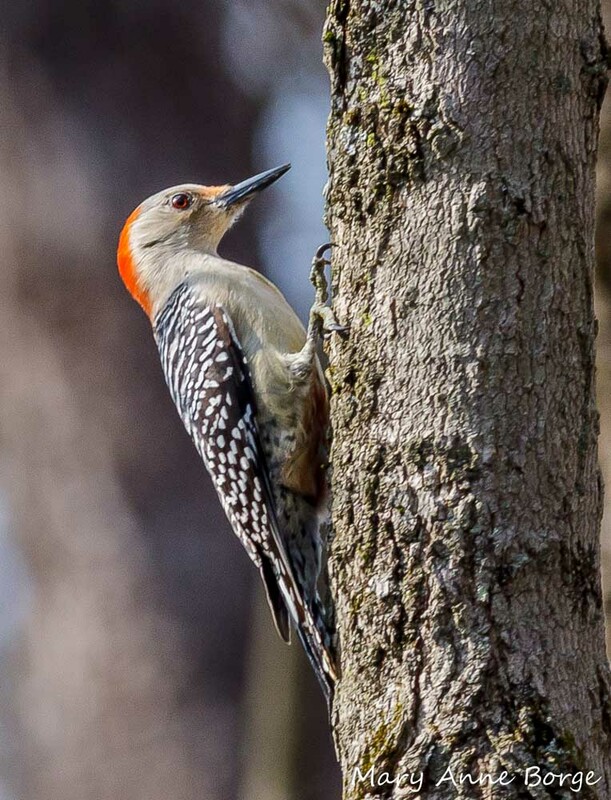 They depend on the leaves of several woody plants species as their food source, including Black Cherry. 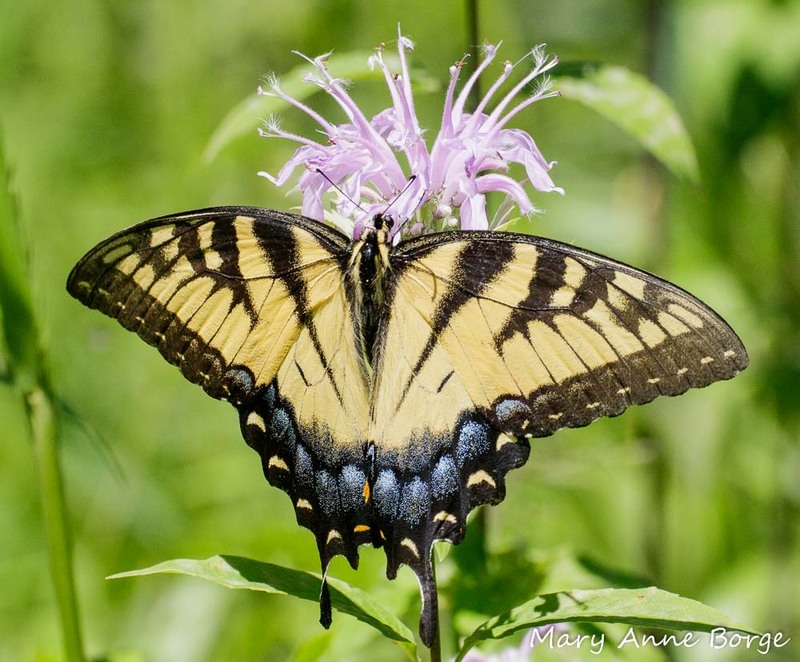 Eastern Tiger Swallowtails are just one of 456 species of butterflies and moths whose caterpillars eat the leaves of Black Cherry and other Prunus species, according to research from Douglas W. Tallamy and the University of Delaware. These caterpillars are in turn an important source of food for birds, especially when they are raising their young. 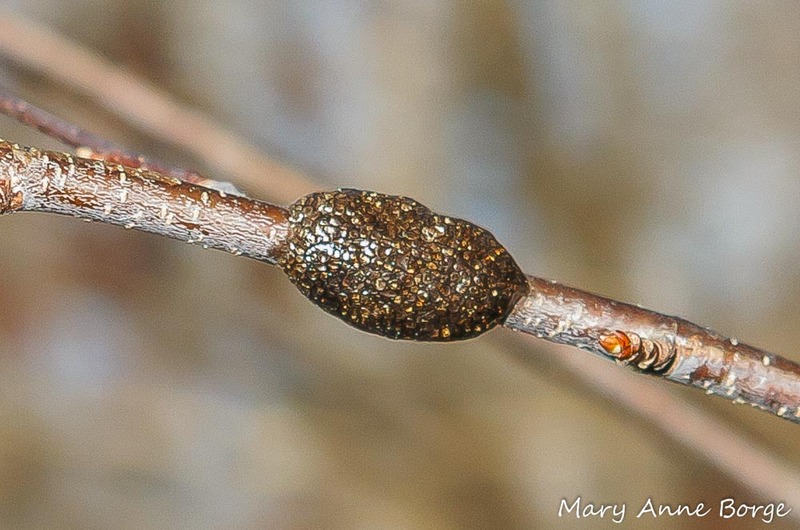 Tent caterpillars favor Black Cherry, a practice that gardeners usually view unfavorably. 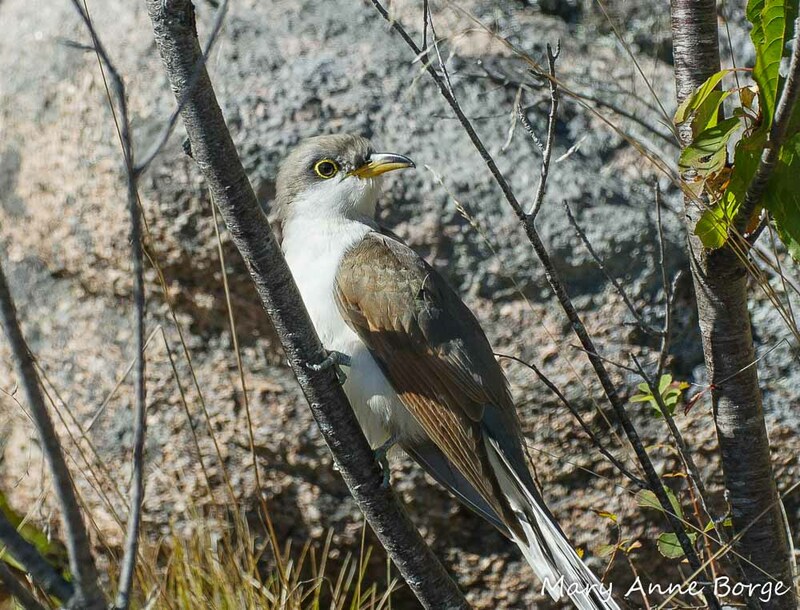 But even Tent caterpillars have redeeming qualities, since they are an important food source for both Yellow- and Black-billed Cuckoos. Adult butterflies and moths may also become food for birds or other insects, and in the case of night-flying moths (including Tent caterpillars that survive to become adult moths), for bats. 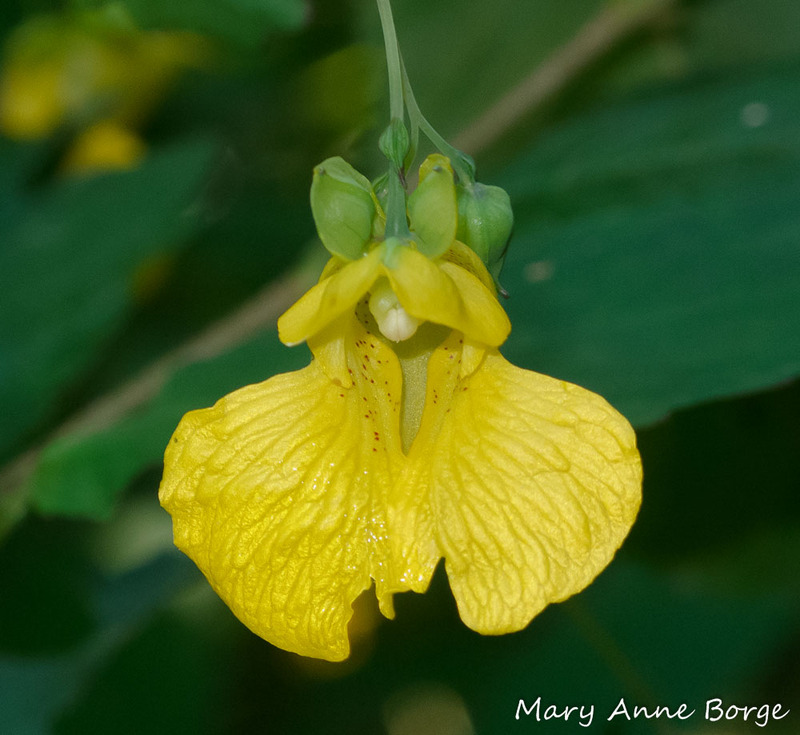 In addition to the nectar offered by its flowers, Black Cherry provides nectar from glands on its leaf stems. These nectaries are not targeting pollinators. Instead, they are there to lure a mercenary army of ants to protect the tree from herbivores, especially caterpillars. The nectaries entice ants to visit the trees for a drink. While there, the ants may also help to keep the caterpillar population in check, since ants also need insect protein as part of their diet. People benefit directly from Black Cherry trees. 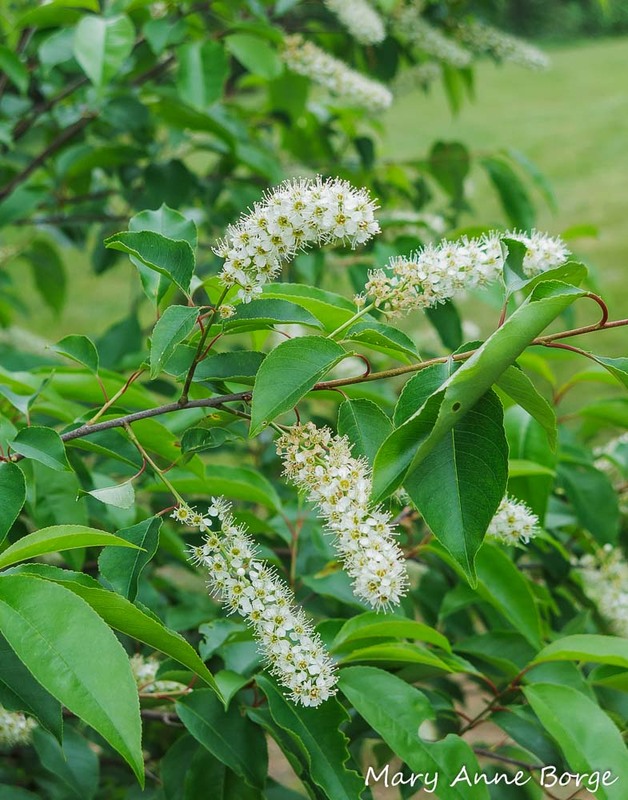 In addition to the beauty of its flowers, fruits and foliage, Black Cherry’s wood is an important timber crop, primarily for use in furniture and cabinet making. Black Cherry’s fruit is used to flavor brandies and to make a liqueur called cherry bounce. The fruit is somewhat bitter, but with added sugar it can be used to make jellies. Eating the raw fruit is not advisable, since the seeds can be toxic. 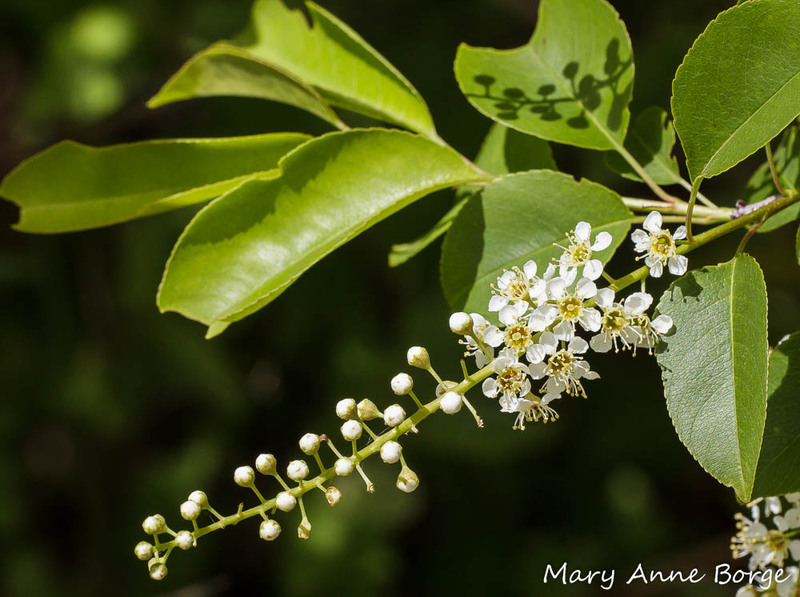 Medicinally, Black Cherry’s inner bark has been used in cough suppressants. Black Cherry can grow to a maximum height of 80-100 feet (24-30 meters). 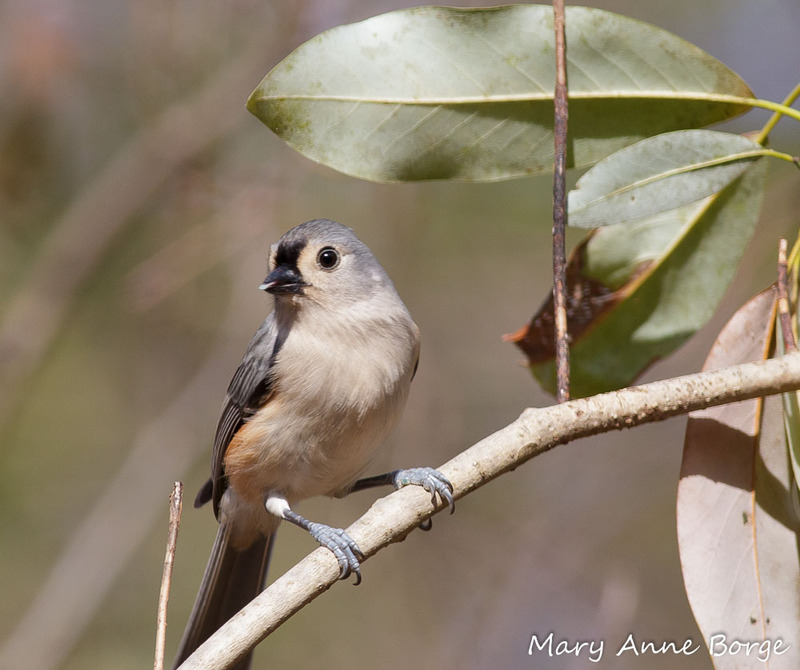 Its range is primarily eastern North America, from Canada through the United States and south into Mexico, although it is an adaptable species and may also be found in some areas of the Pacific Northwest. 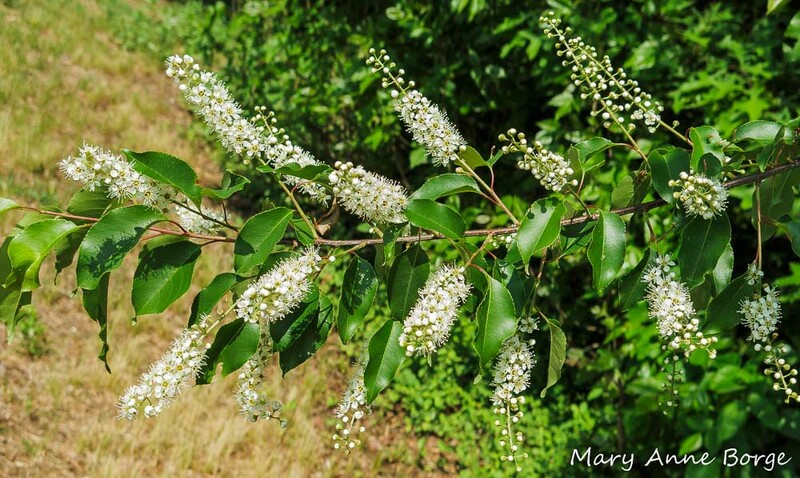 Providing beauty, timber, food and medicine for humans, food for birds, mammals, pollinators and hundreds of other insects, Black Cherry is among our most productive native trees.